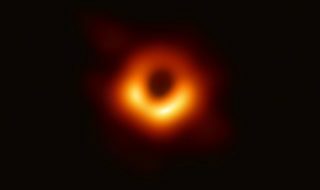 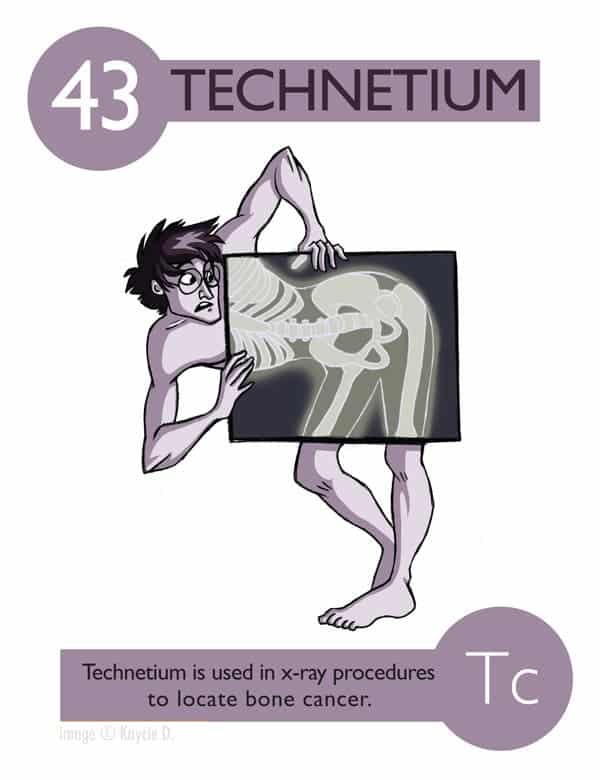 Science not only involves a lot of technical know-how, but also a great deal of creativity and imagination. 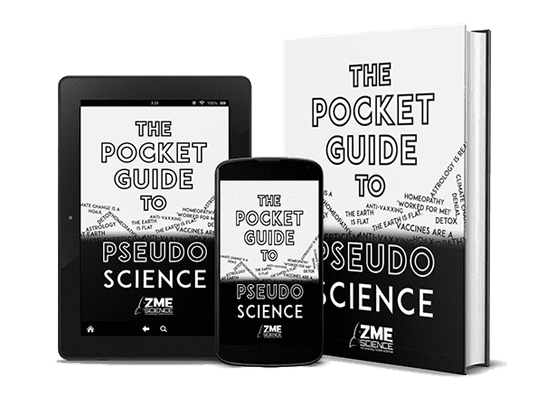 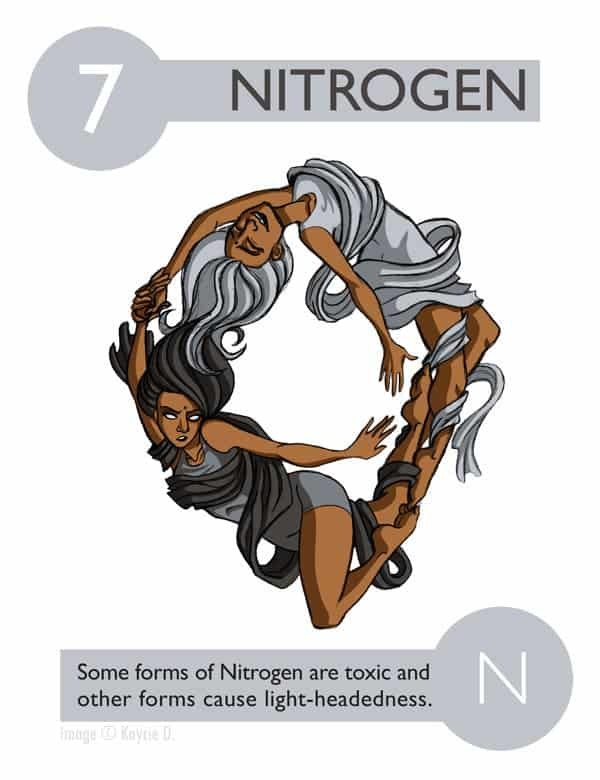 Often science and art are seen as opposites, which can’t be further from the truth. 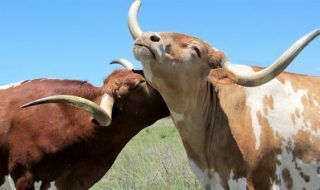 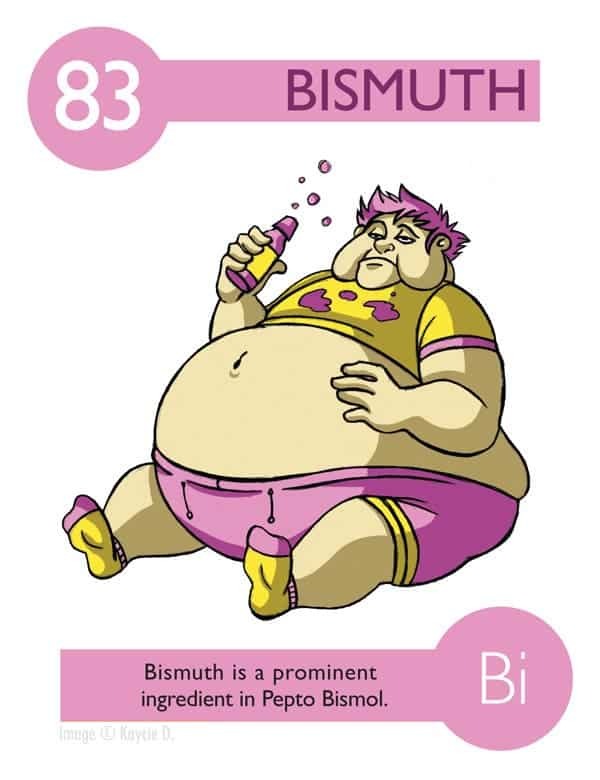 Worst case, they complement each other. 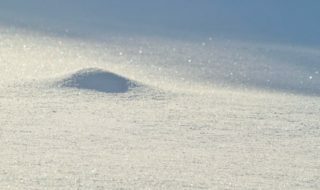 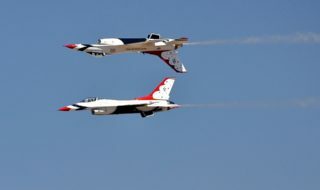 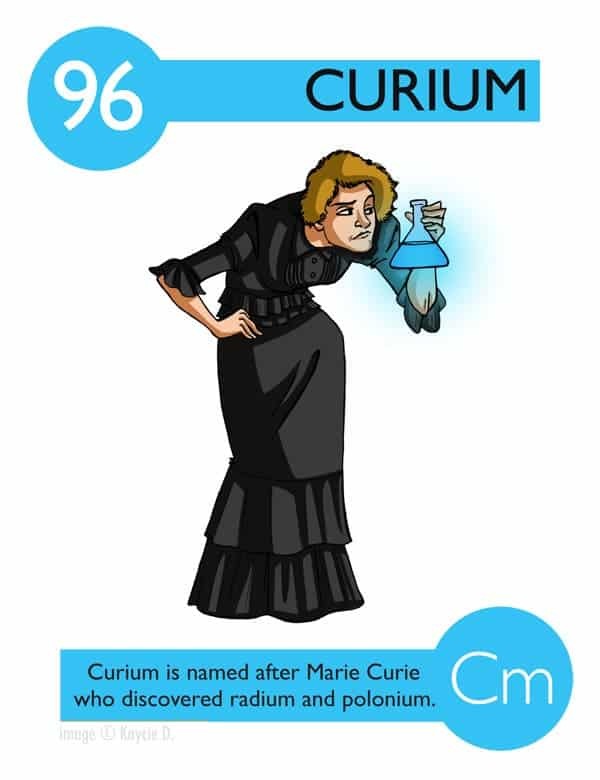 For one, art may actually be the best way to communicate science to those who have yet to take a class or lacked an inspired influence in its due time. 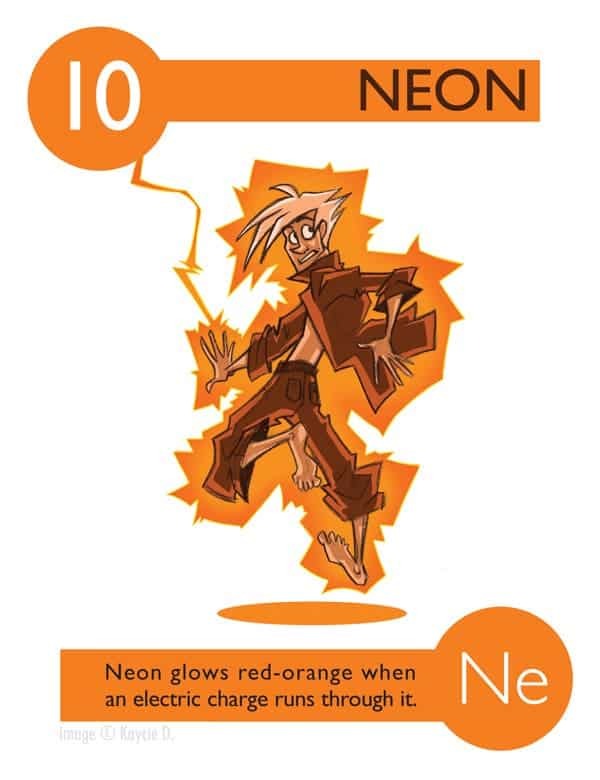 Take for instance Kaycie Dunlap‘s graduate thesis called Elements – Experiments in Character Design. 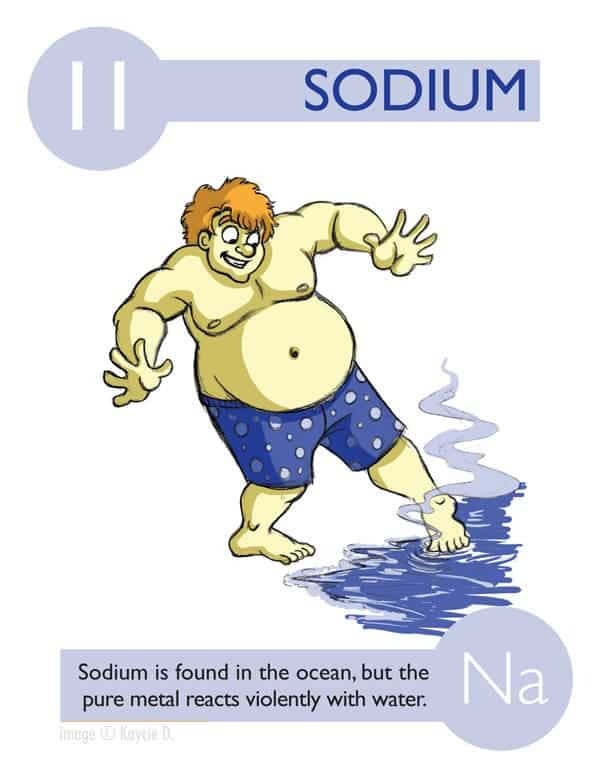 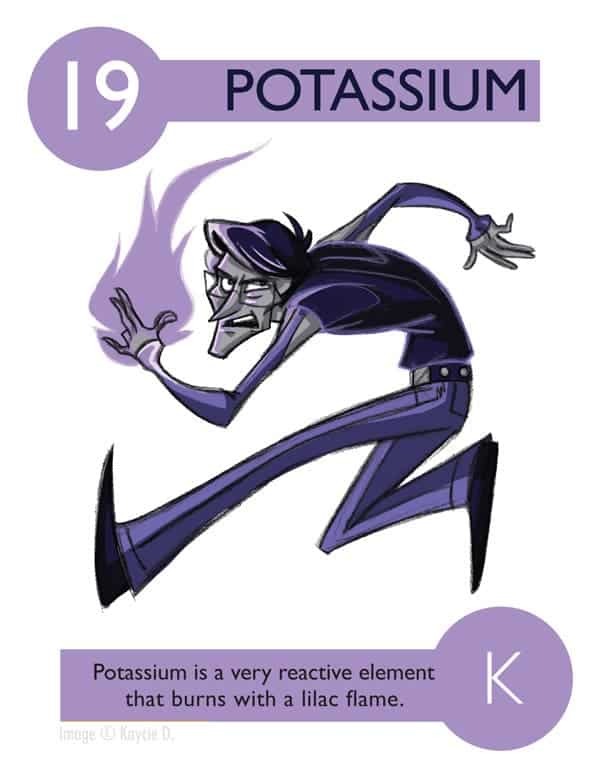 For her project Kaycie decided to make us of her passion for character design to give chemistry a more humane look. 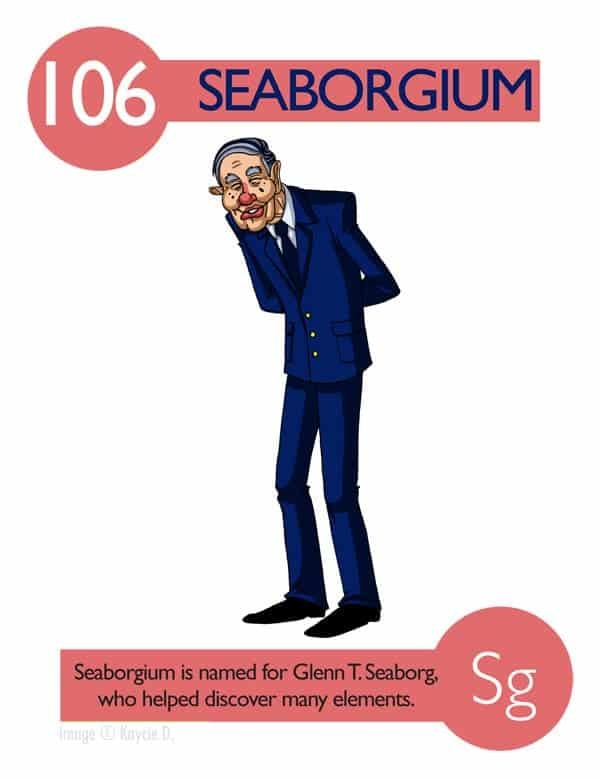 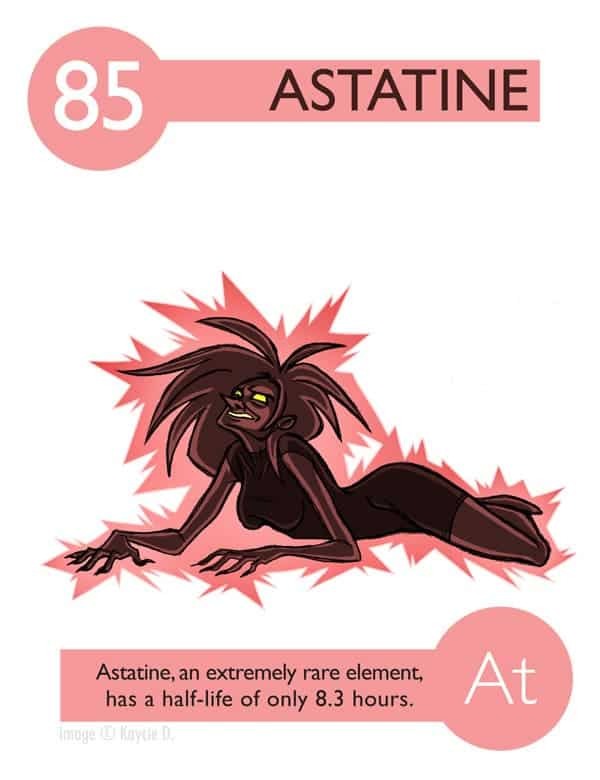 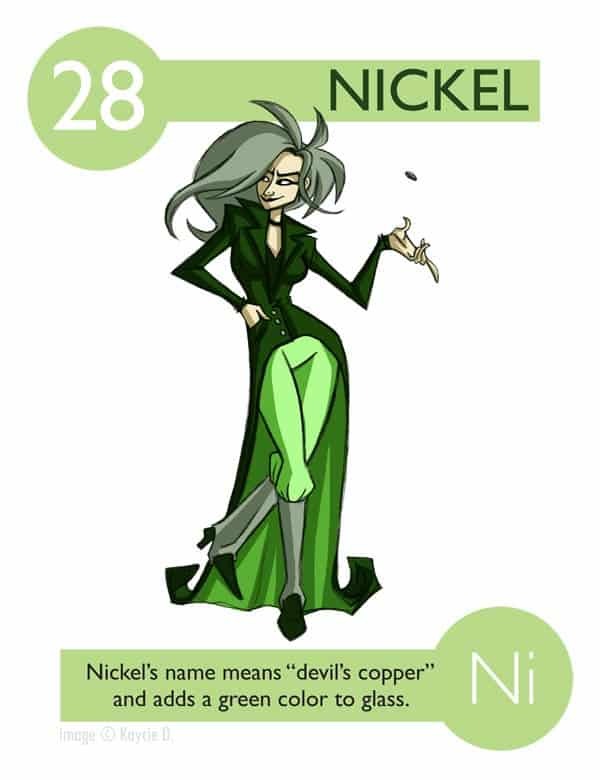 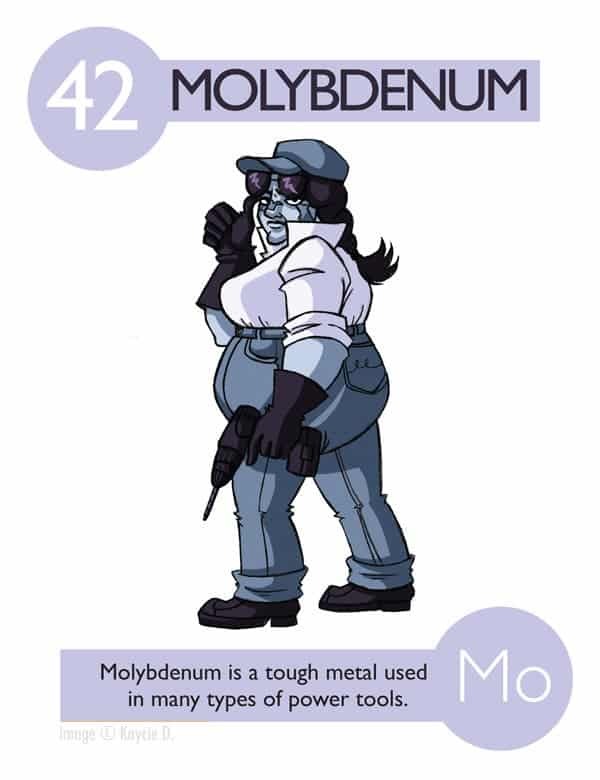 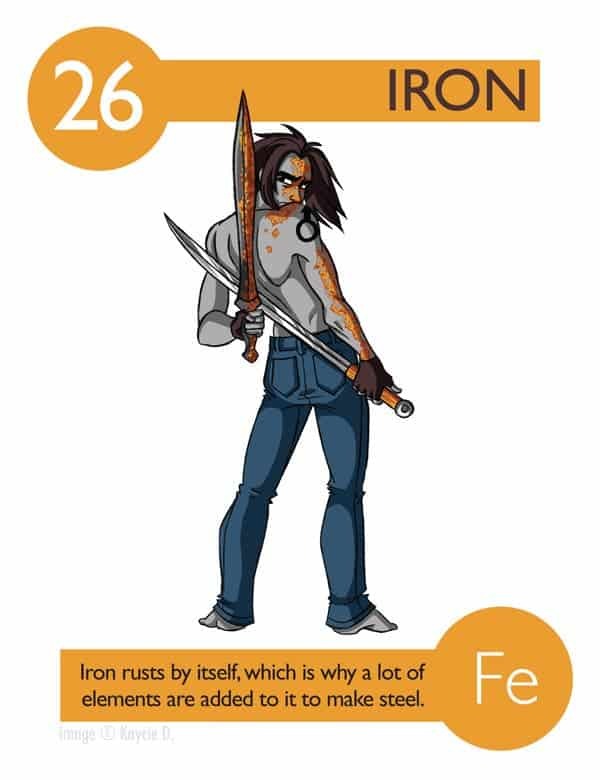 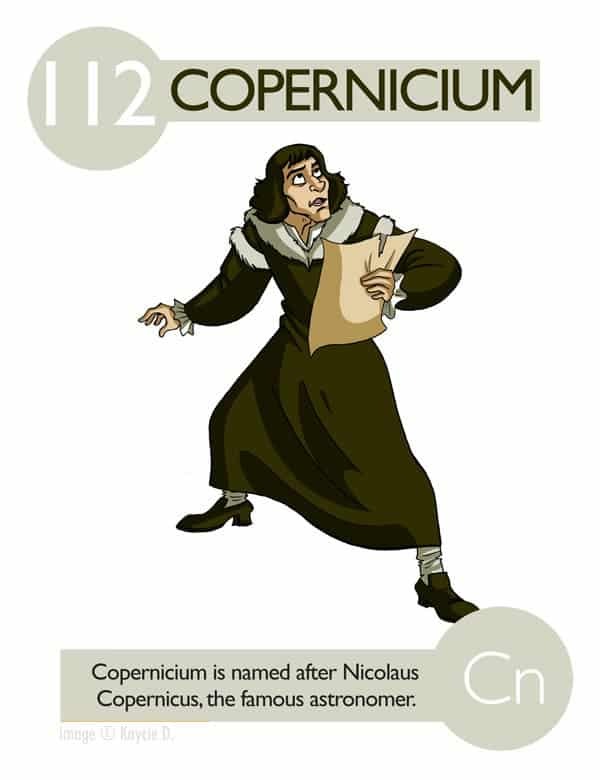 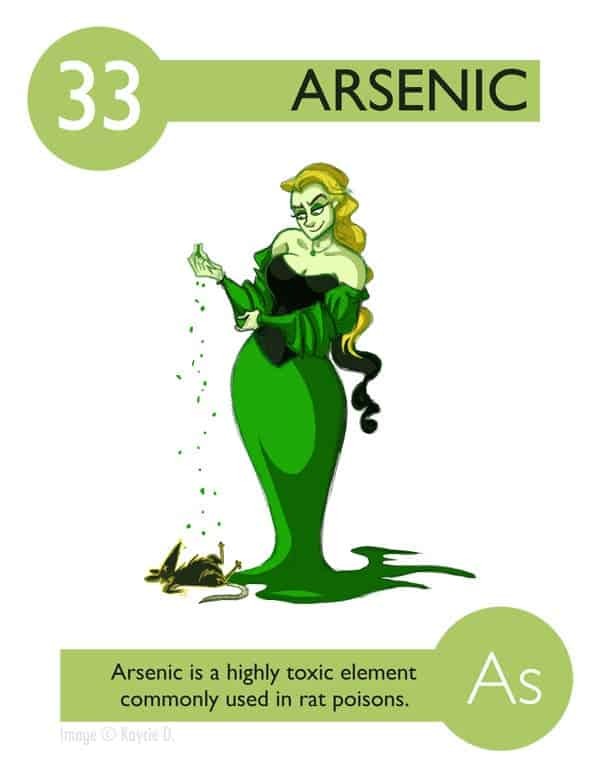 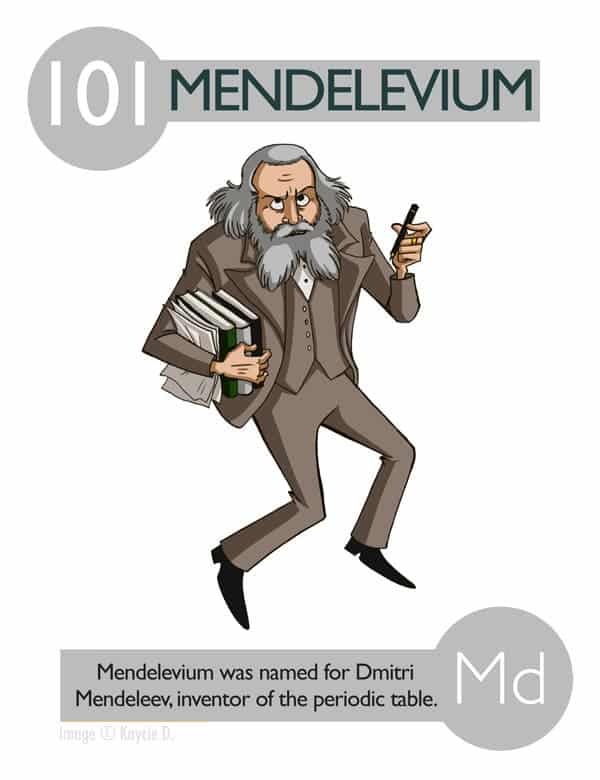 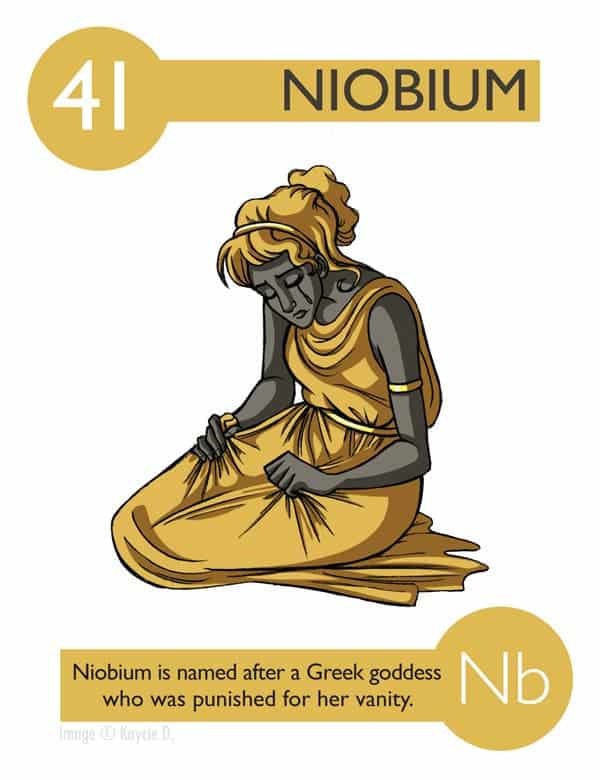 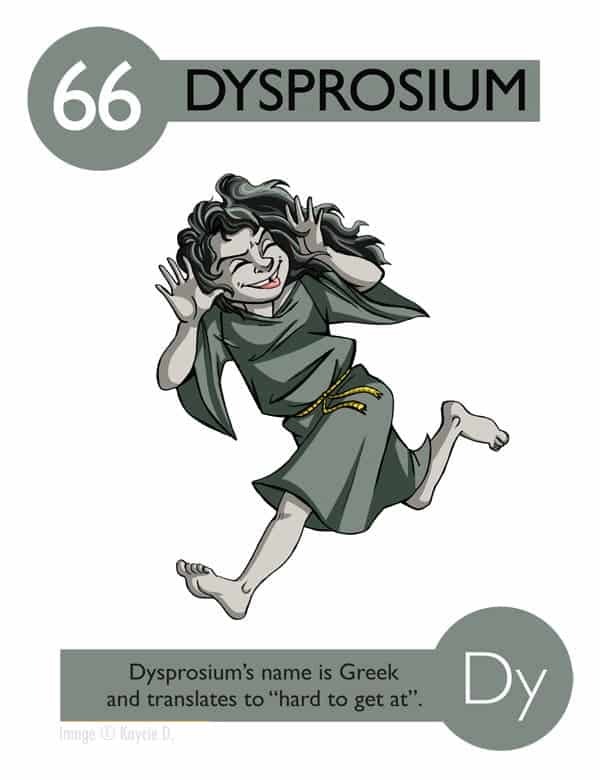 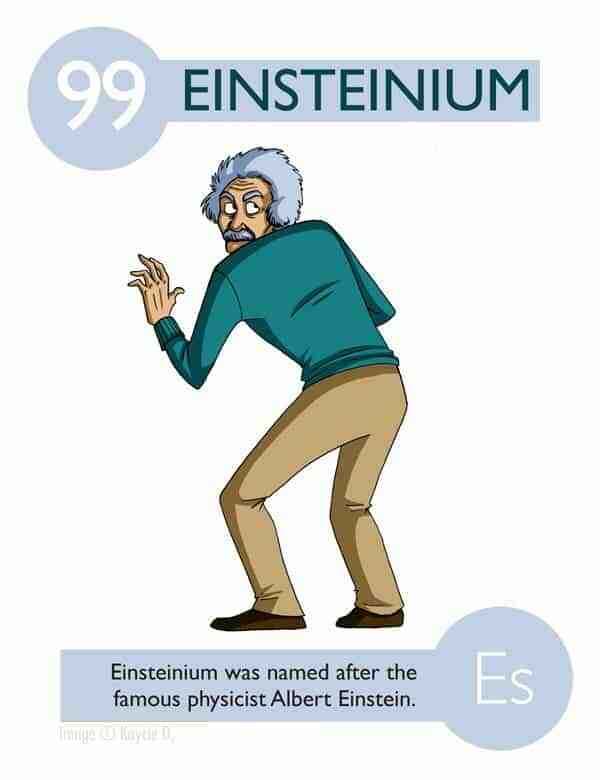 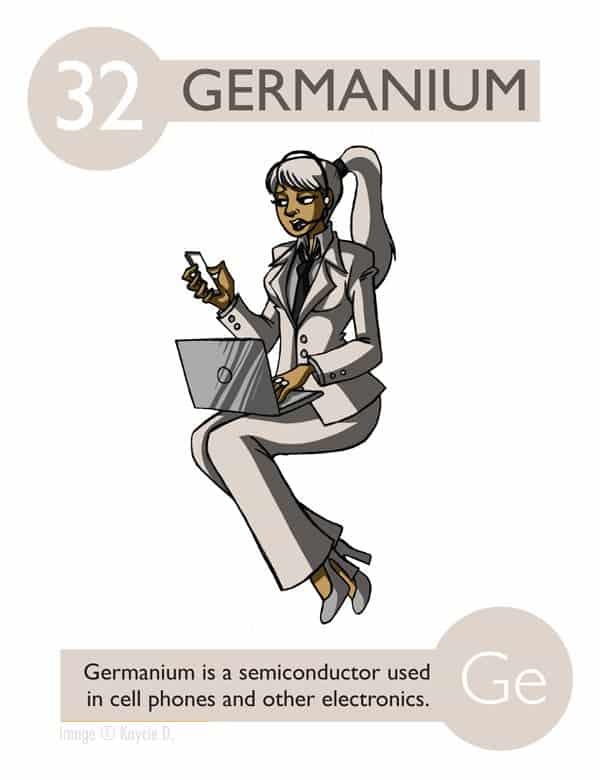 So she ambitiously sketched by hand a witty character for every 112 chemical elements from the period table. 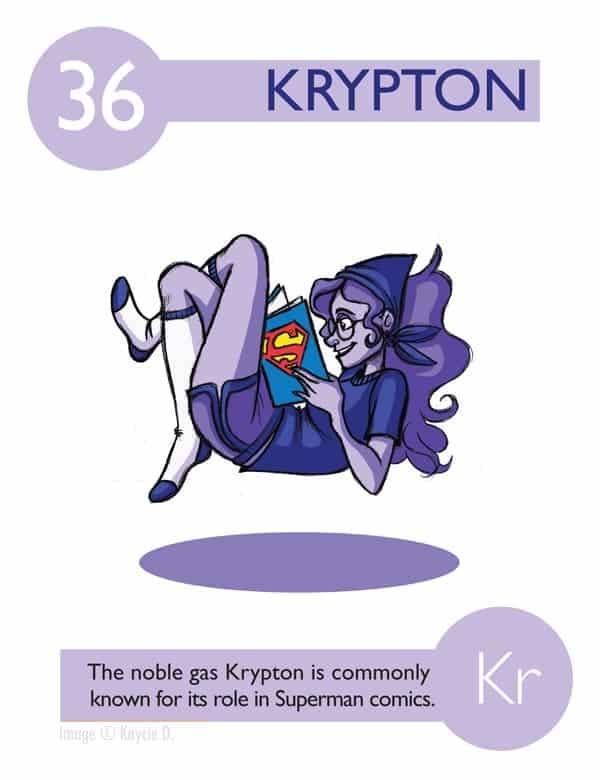 For some elements, Kaycie was inspired by her friends, while others were inspired by celebrities. 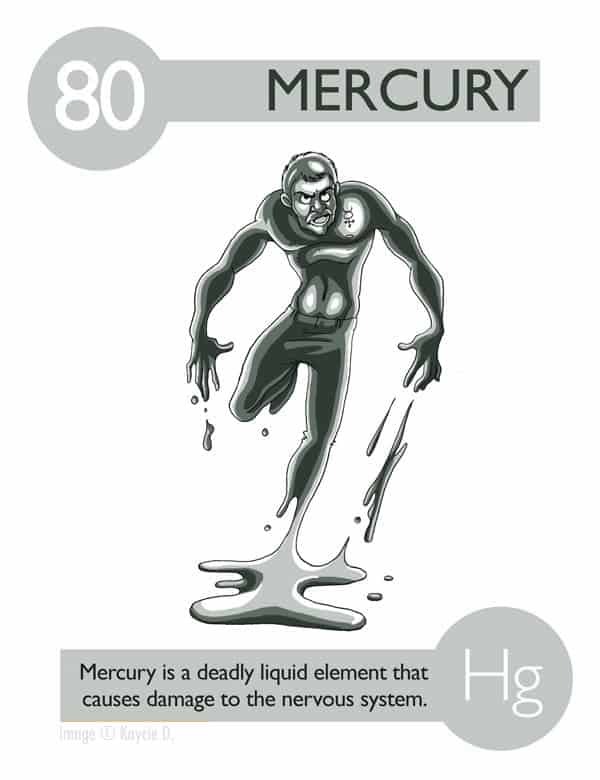 For instance, Freddy Mercury is showcased for Mercury. 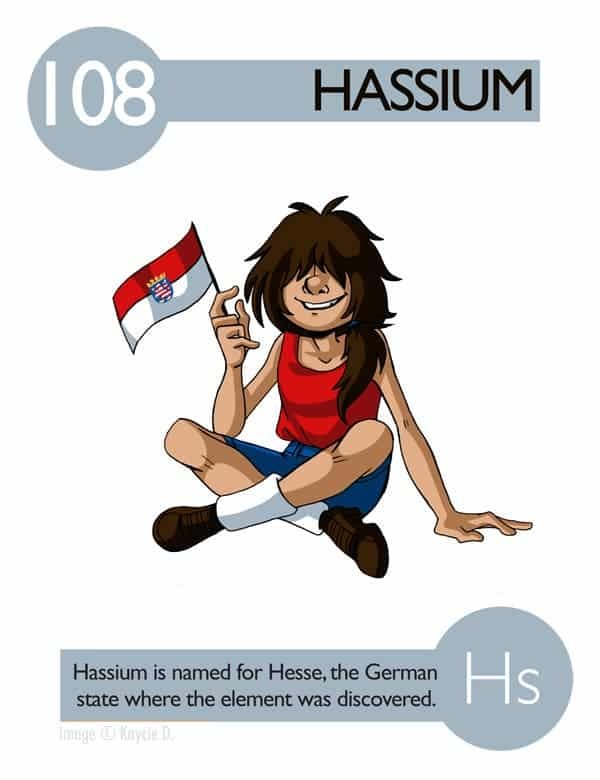 “An artist from birth, I was the kid who drew in a class all the time. 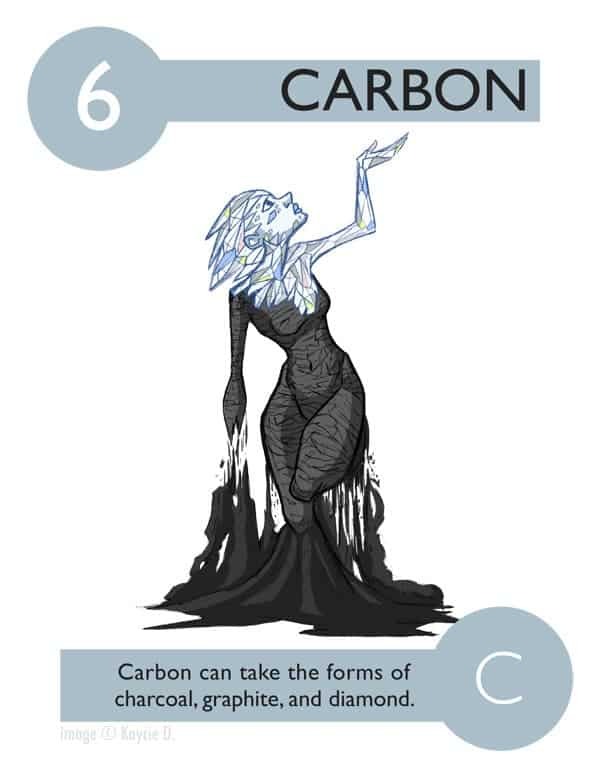 This phase perpetuated well into art school – where it was actually OK to draw in class! 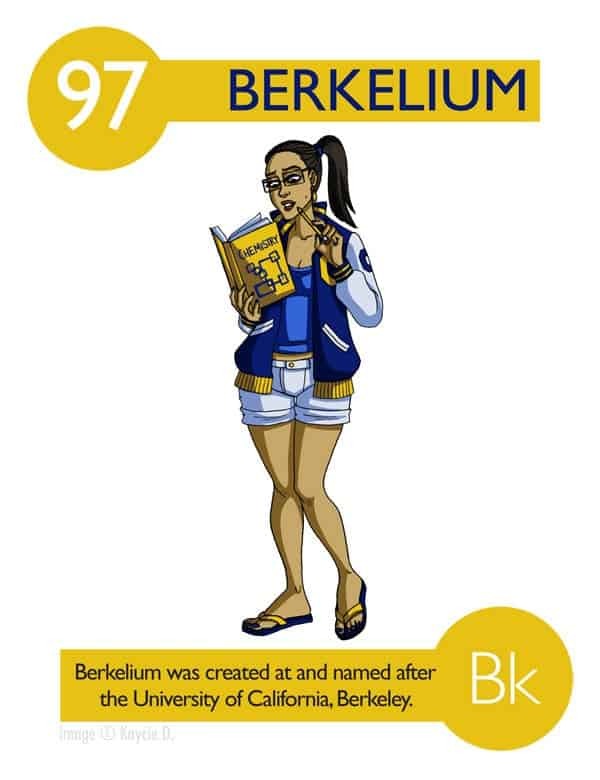 As senior year approached, they encouraged us to come up with an idea for our thesis that combined everything we’d learned at school and gave insight as to who we were and what inspired us. 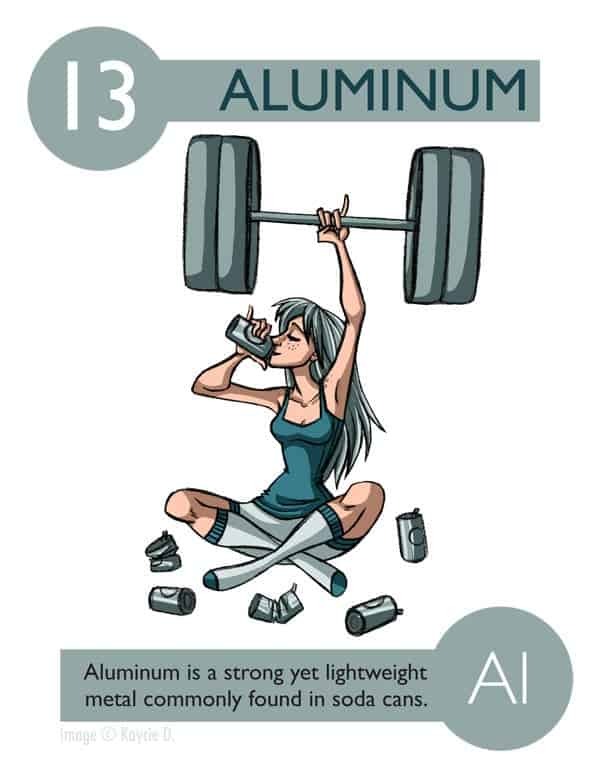 Drawn in pencil and colored in Photoshop, I took my first love – characters – and combined it with a strong idea to create these 112 illustrations,” Kaycie wrote on BoredPanda. 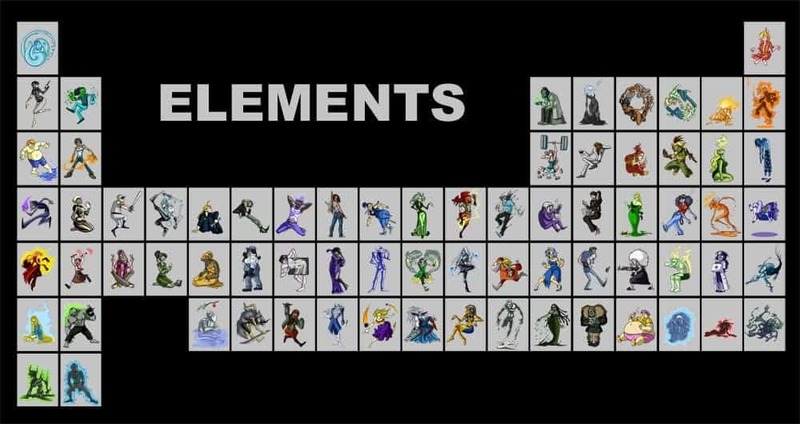 Kaycie is now working on linking all these characters under a common story, which might turn into a comic or even an animation. 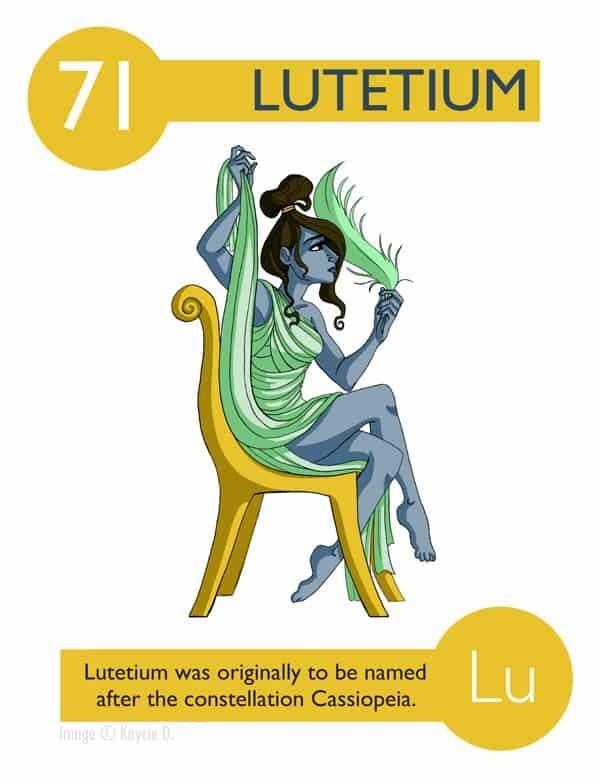 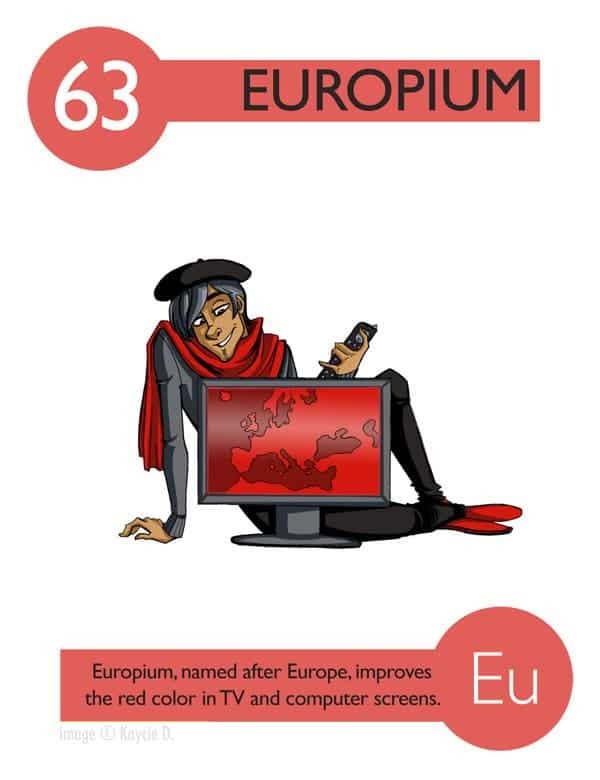 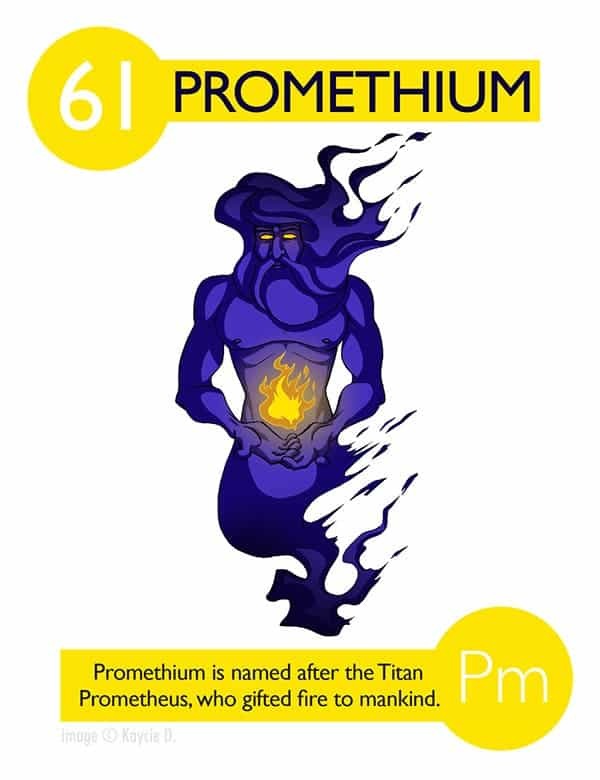 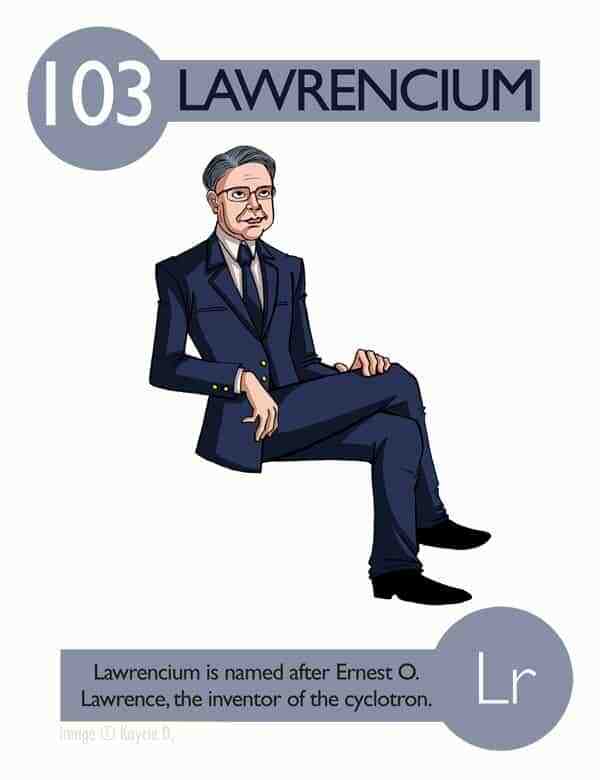 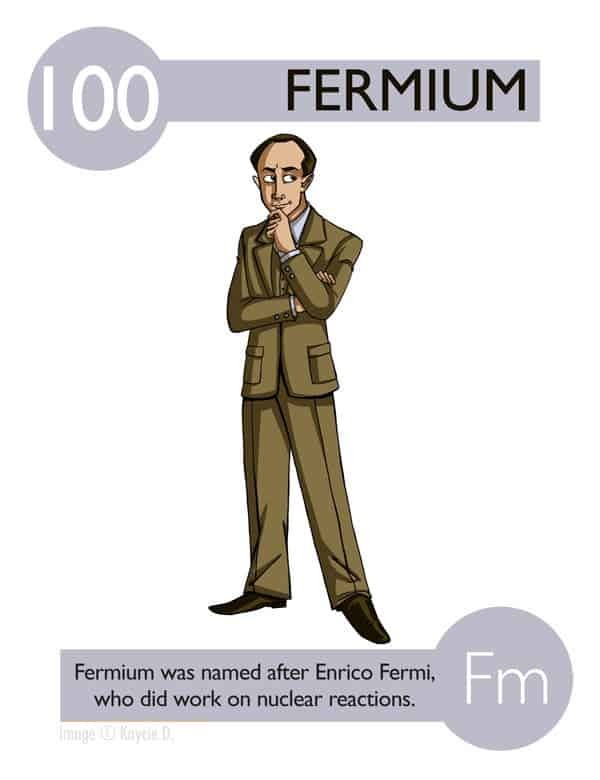 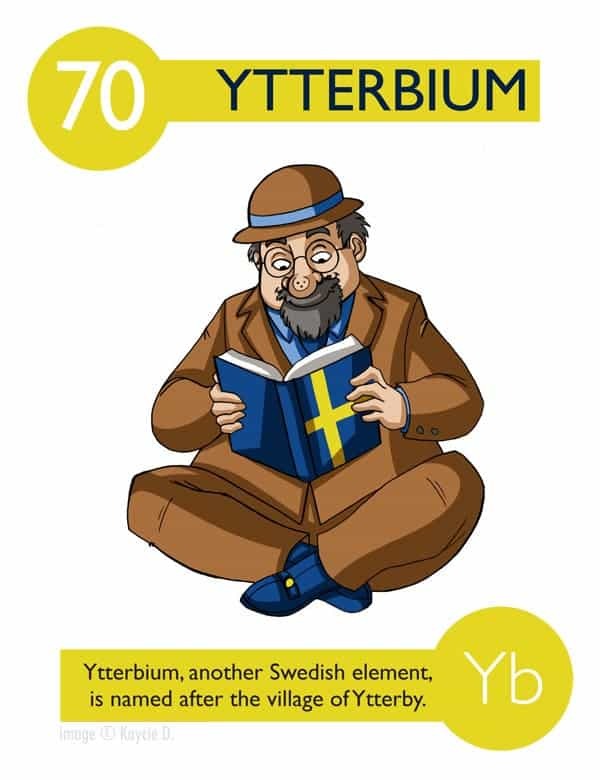 The remaining six elements from the periodic table which haven’t been illustrated (yet) are Ununtrium, Flerovium, Ununpentium, Livermorium, Ununseptium, Ununonctium. 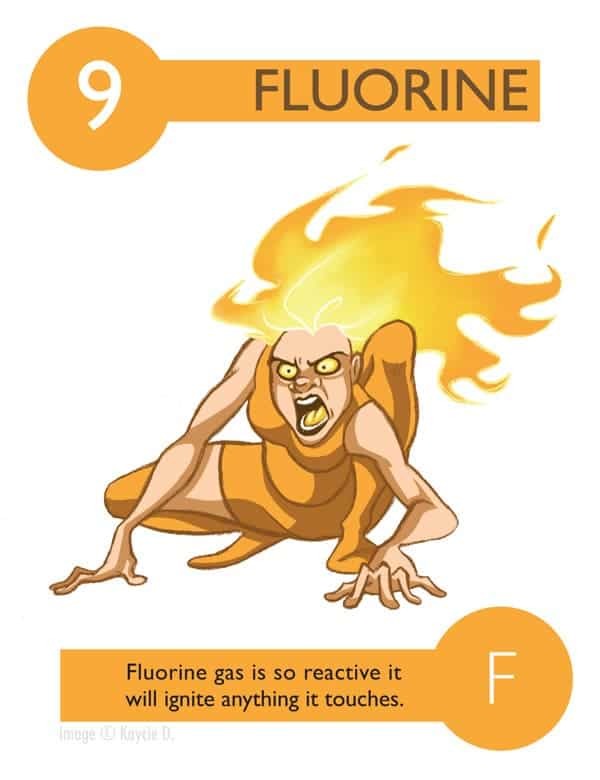 If you’d like these in print, Kaycie turned her project into a deck of flash cards. 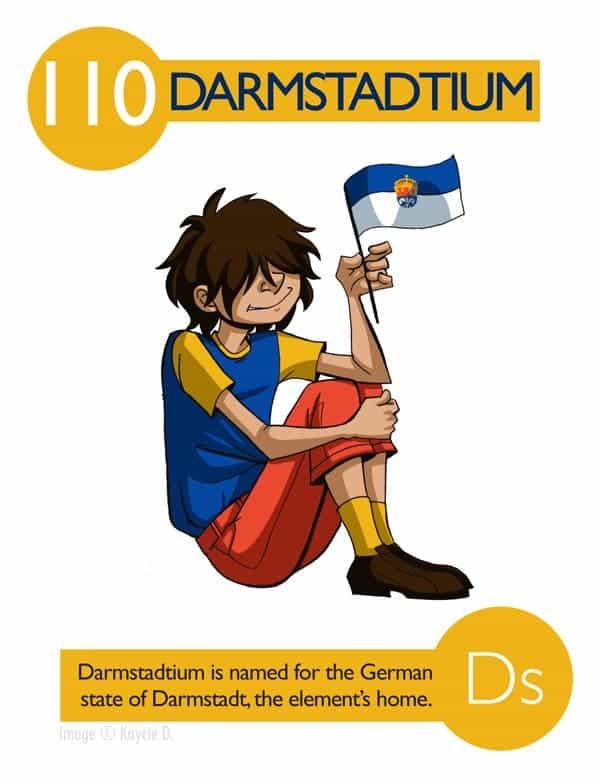 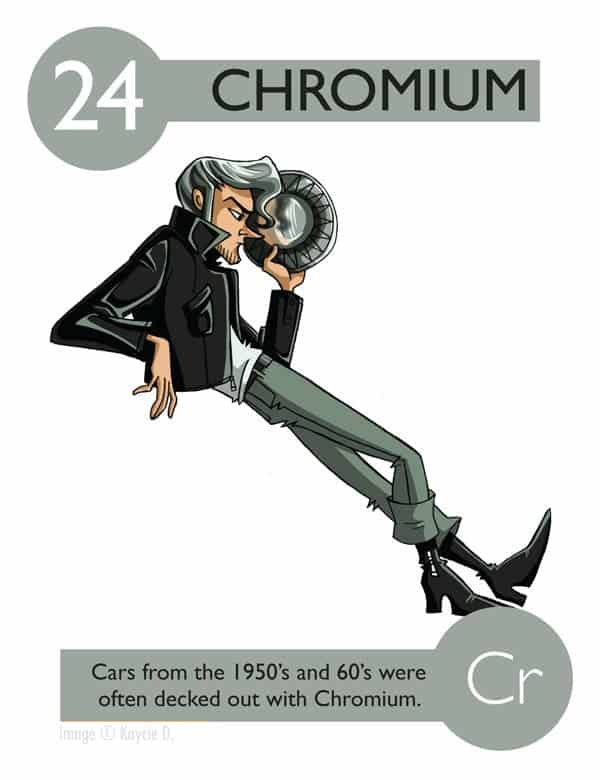 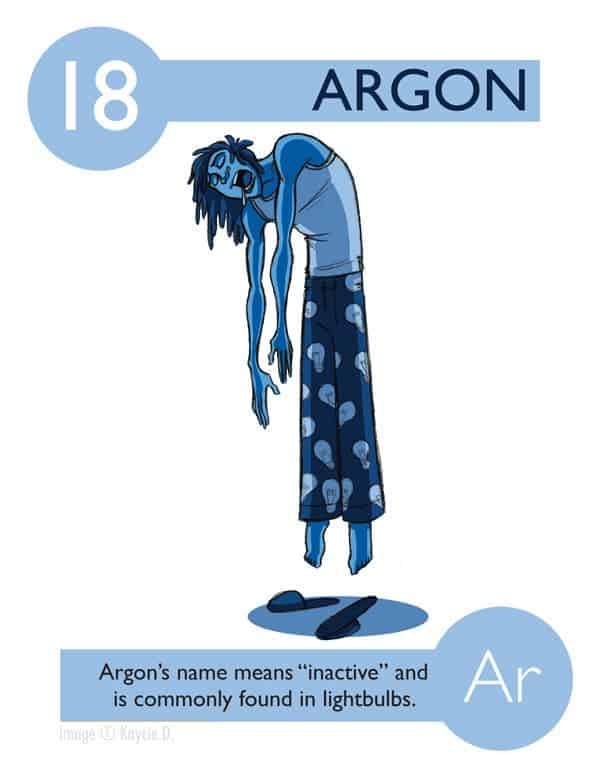 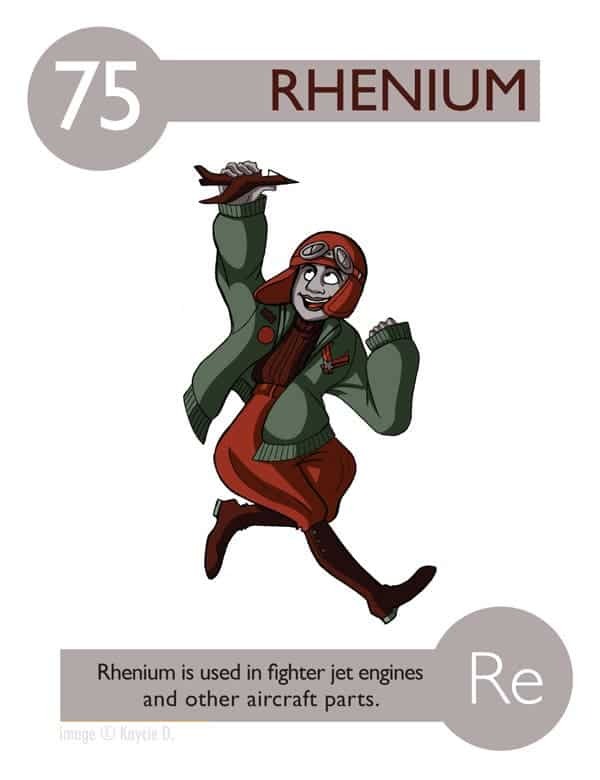 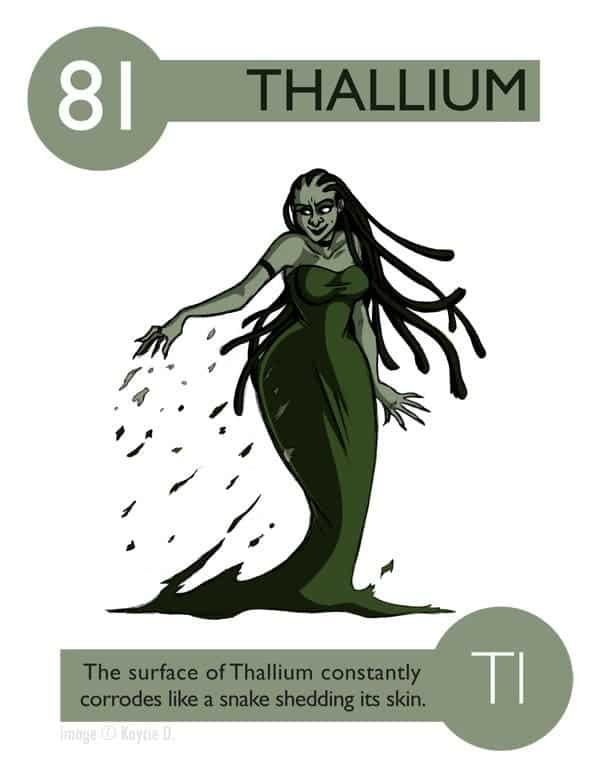 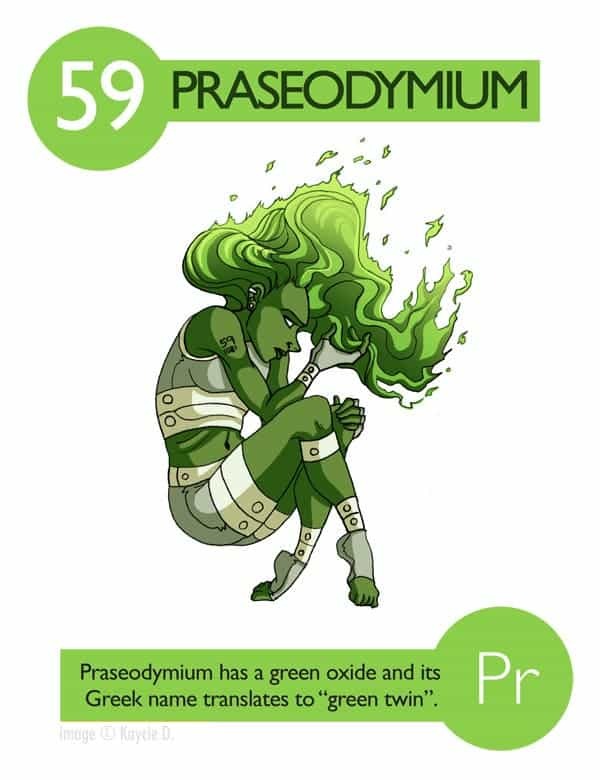 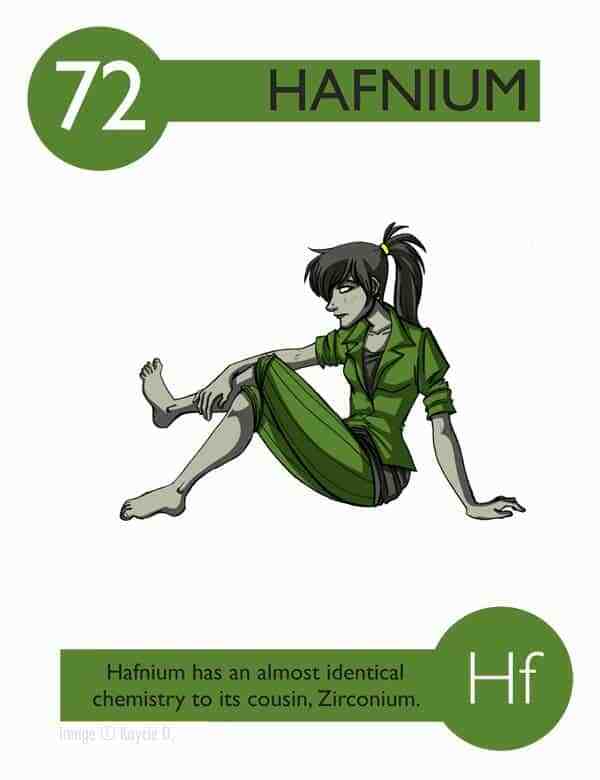 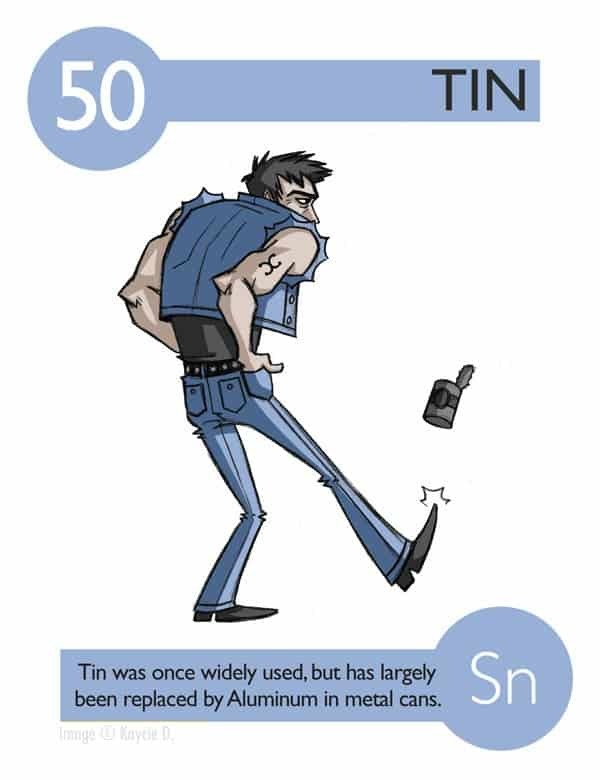 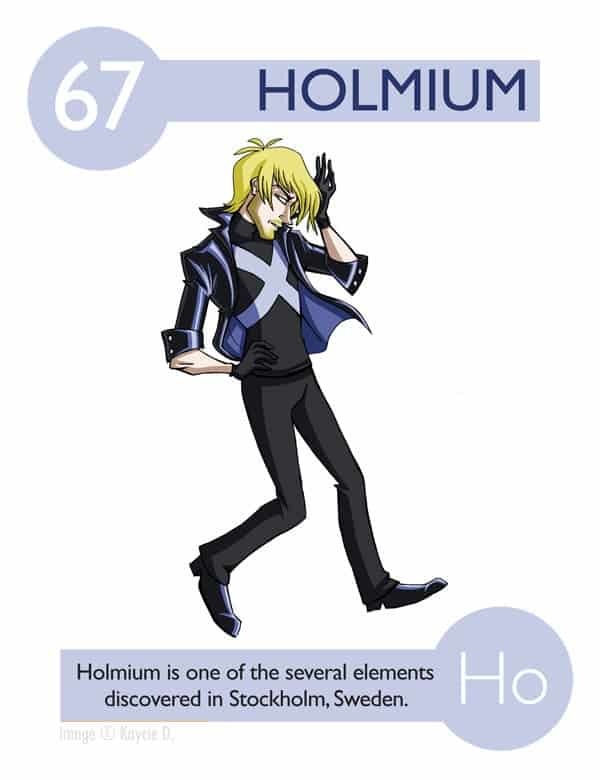 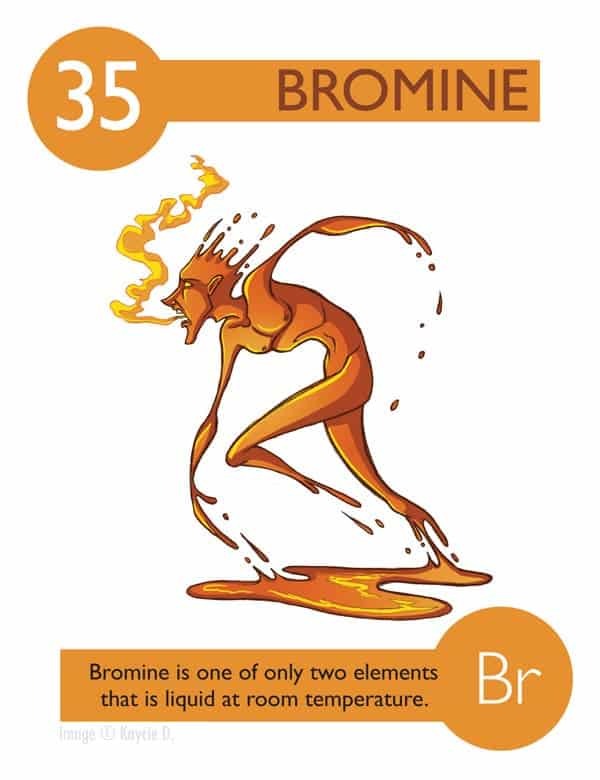 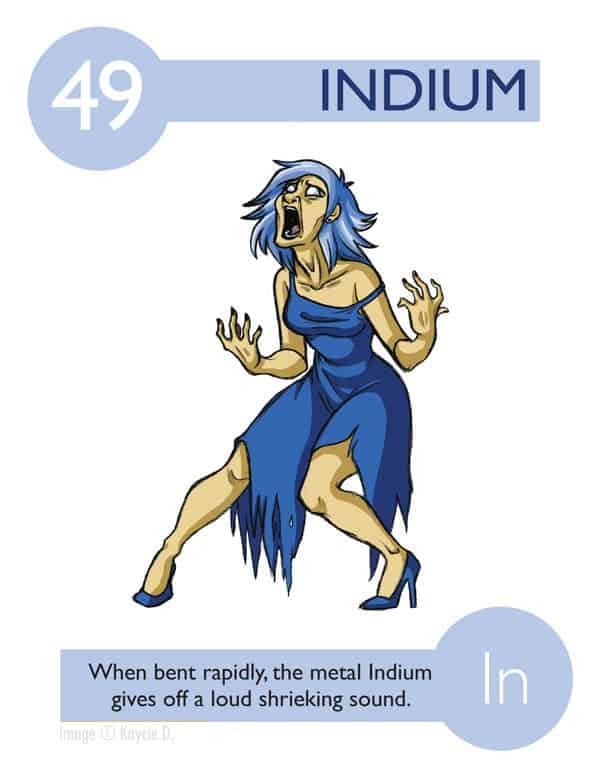 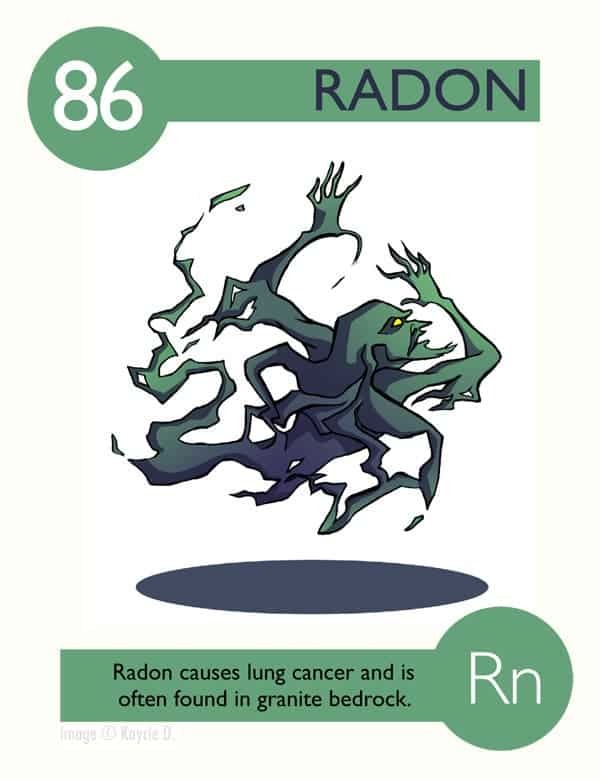 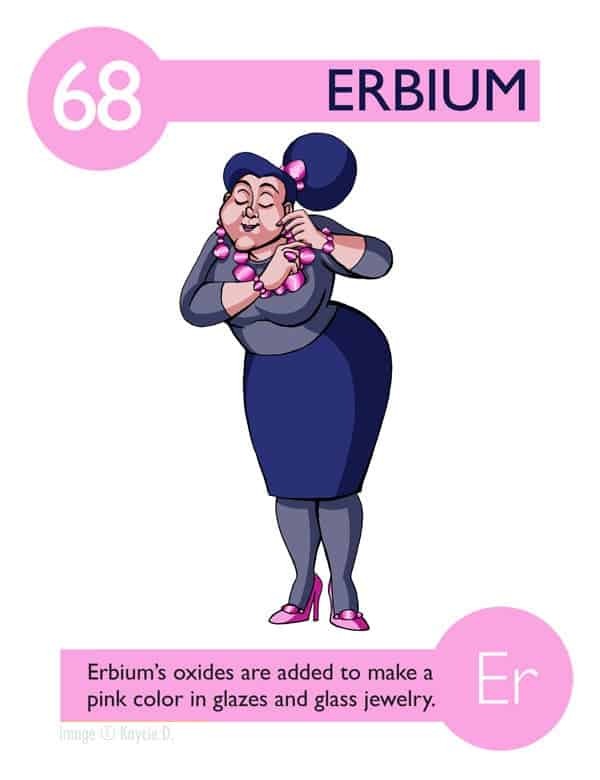 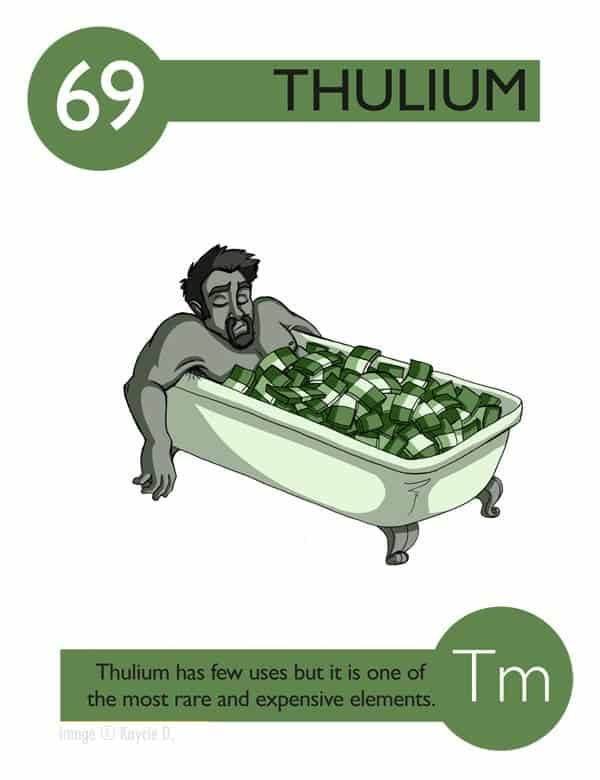 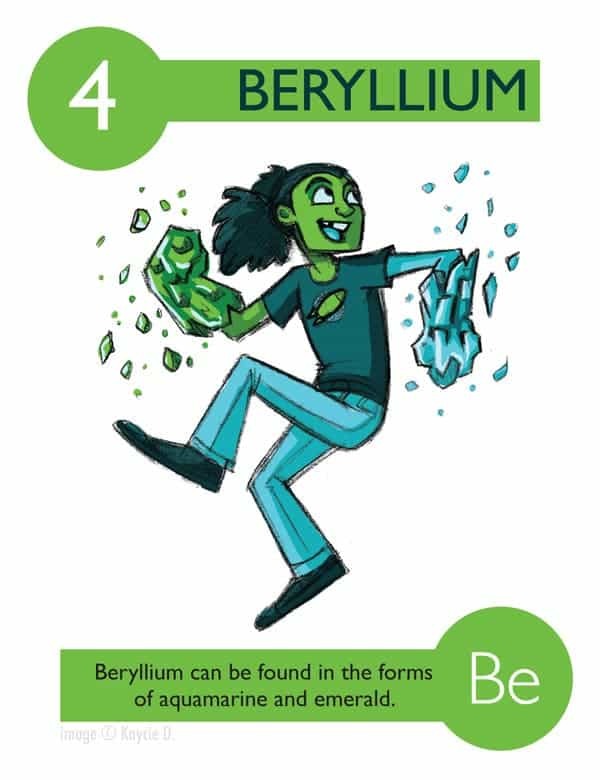 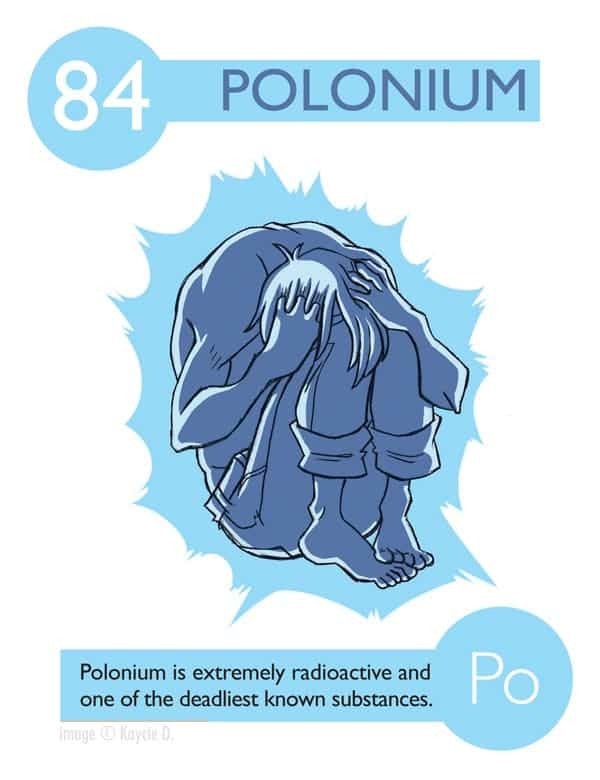 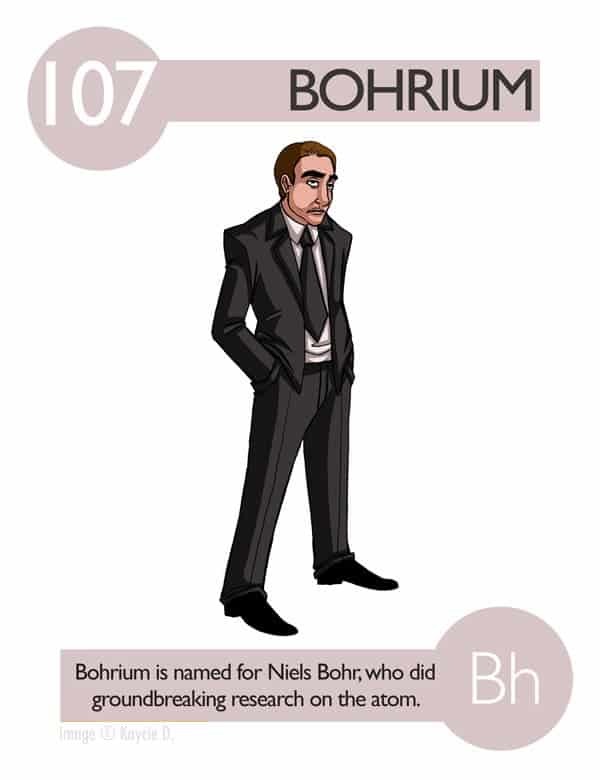 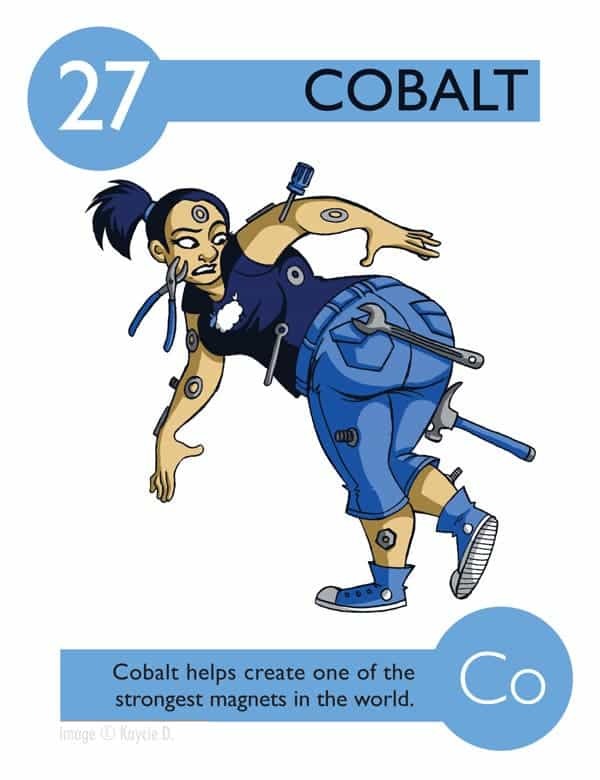 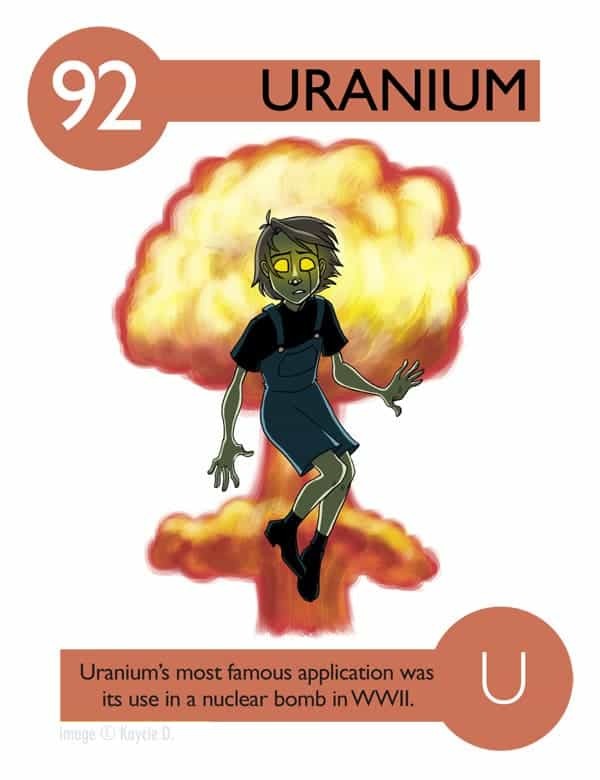 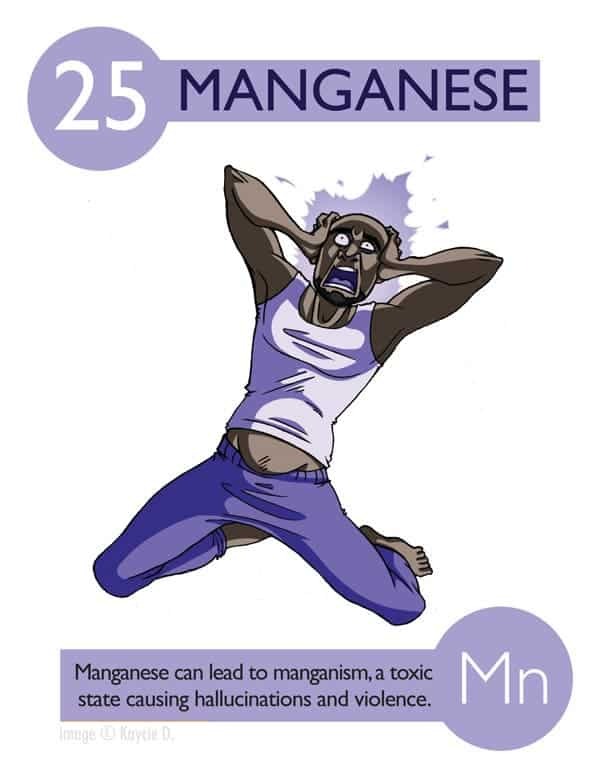 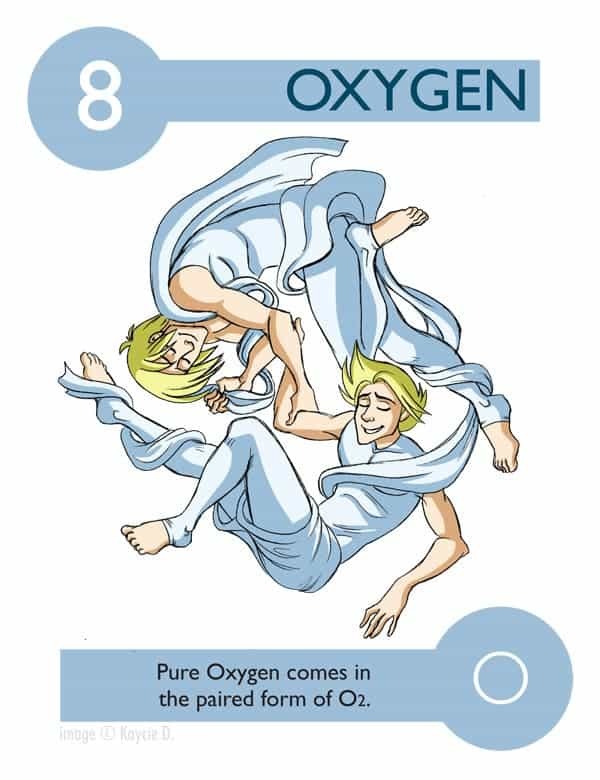 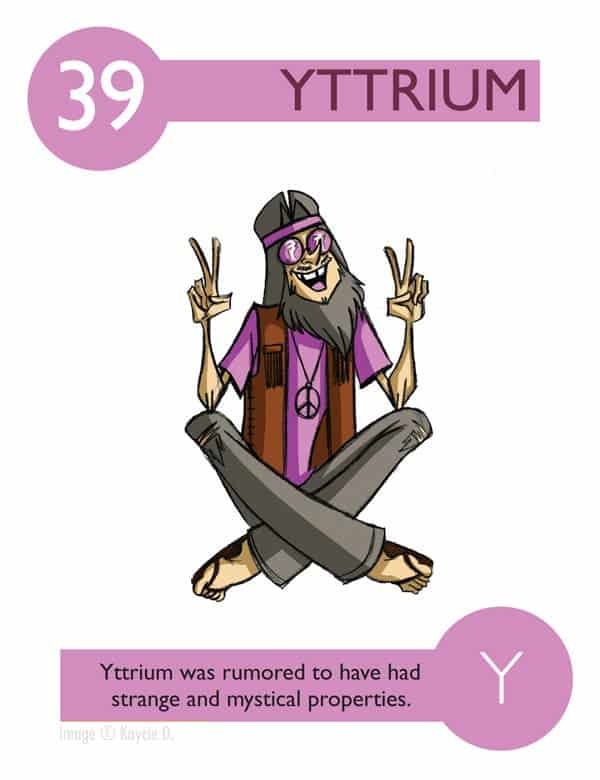 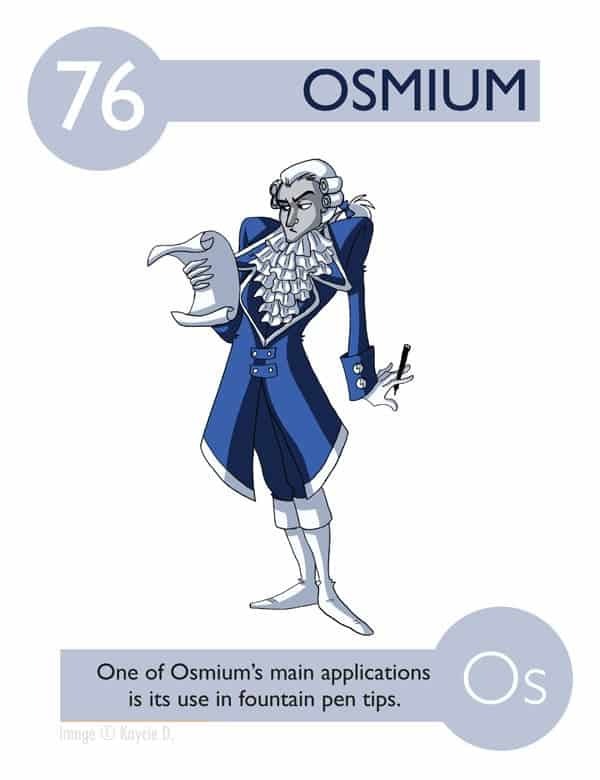 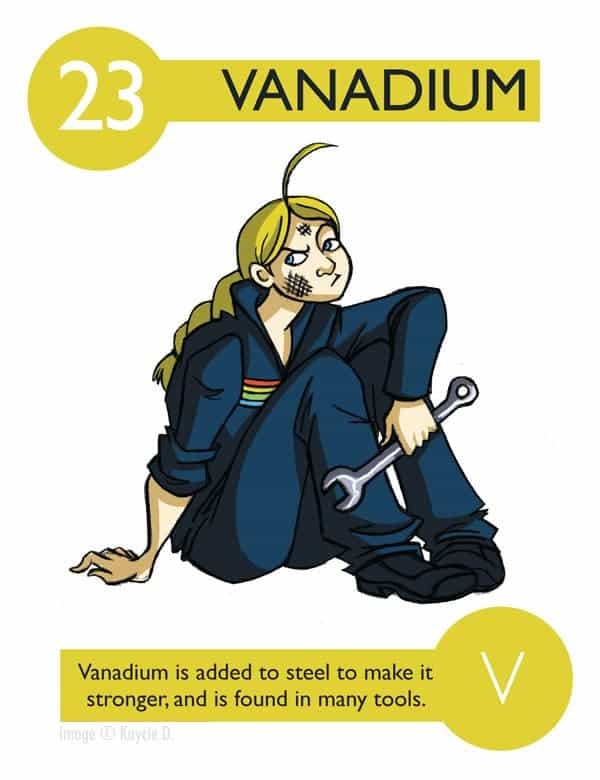 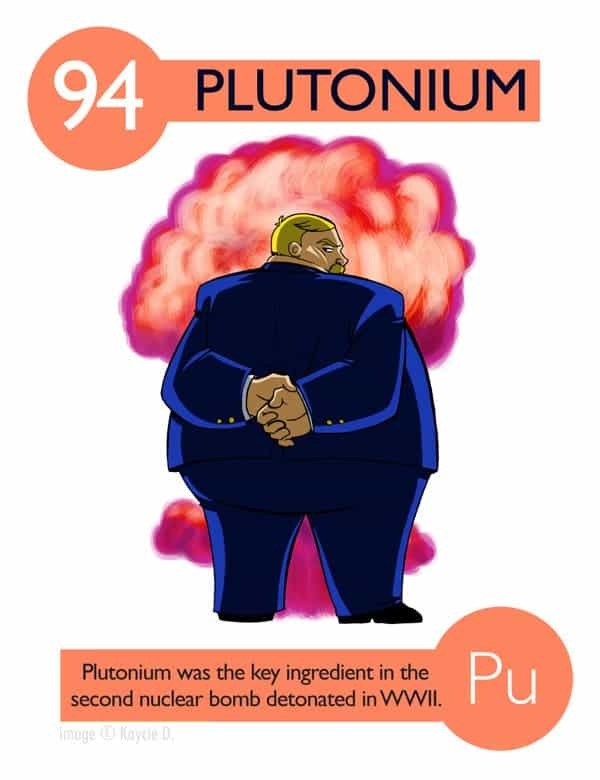 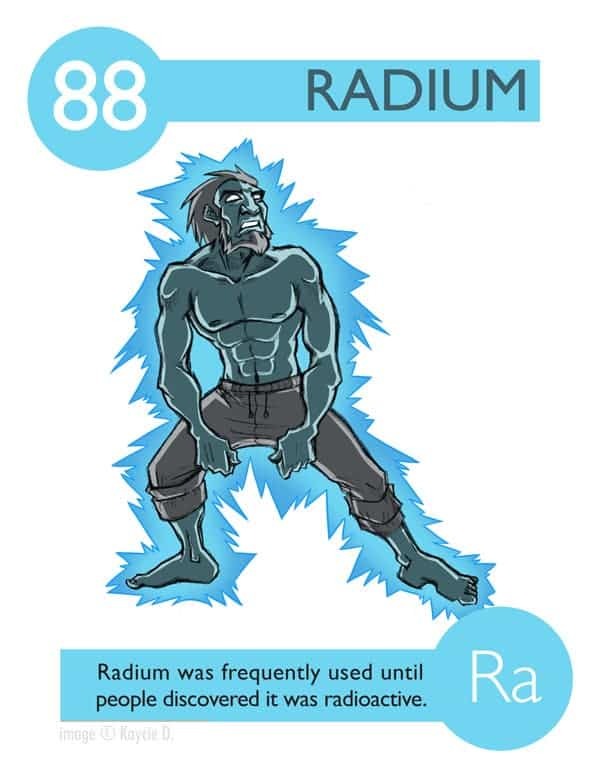 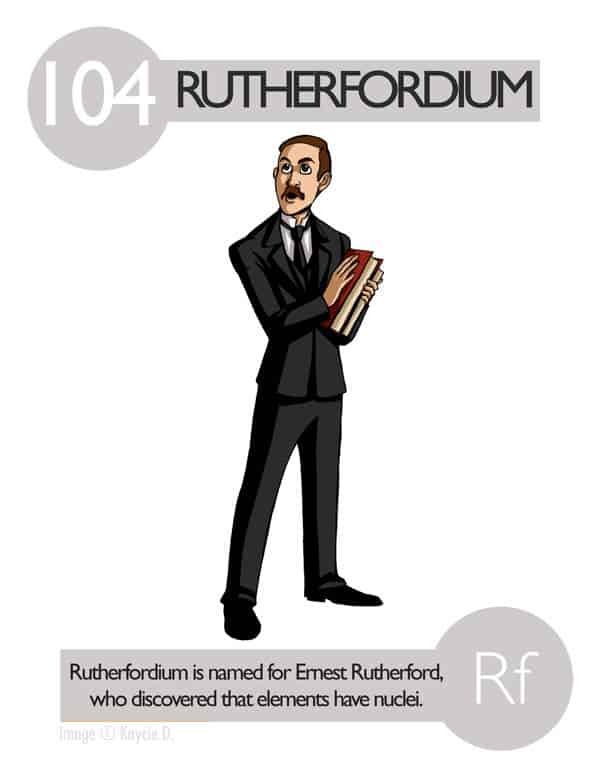 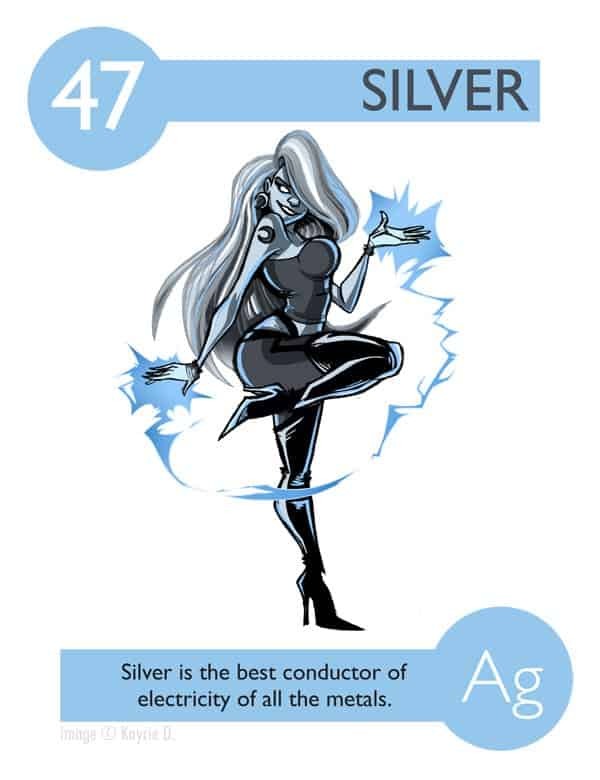 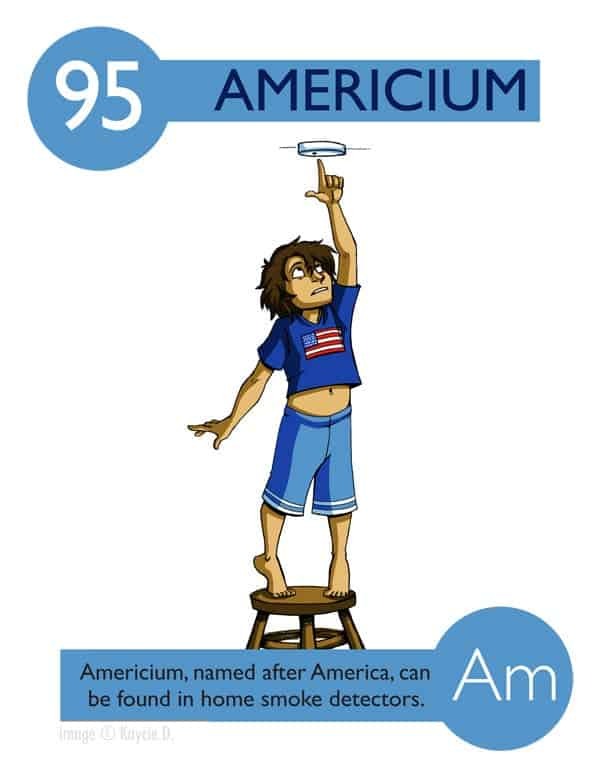 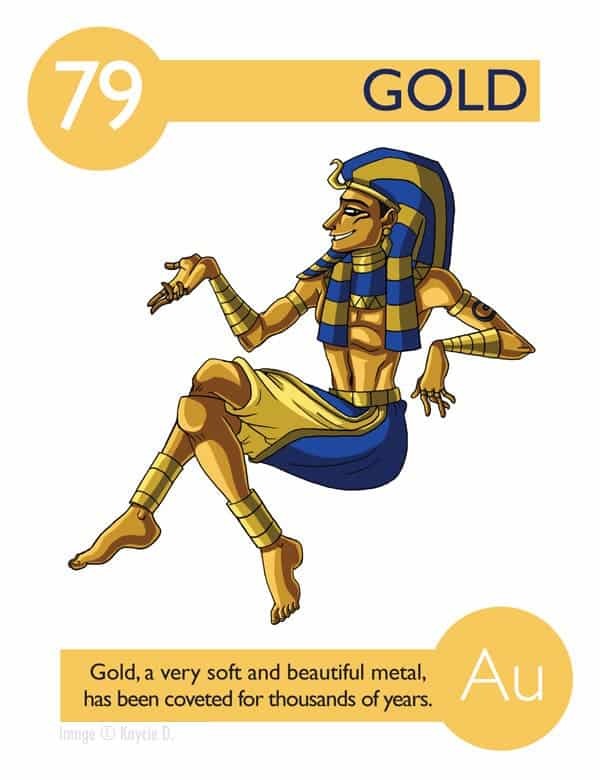 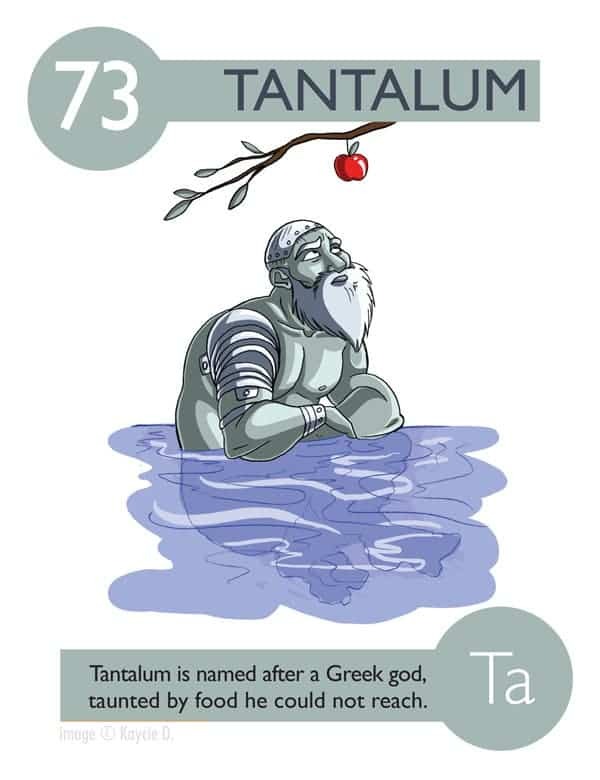 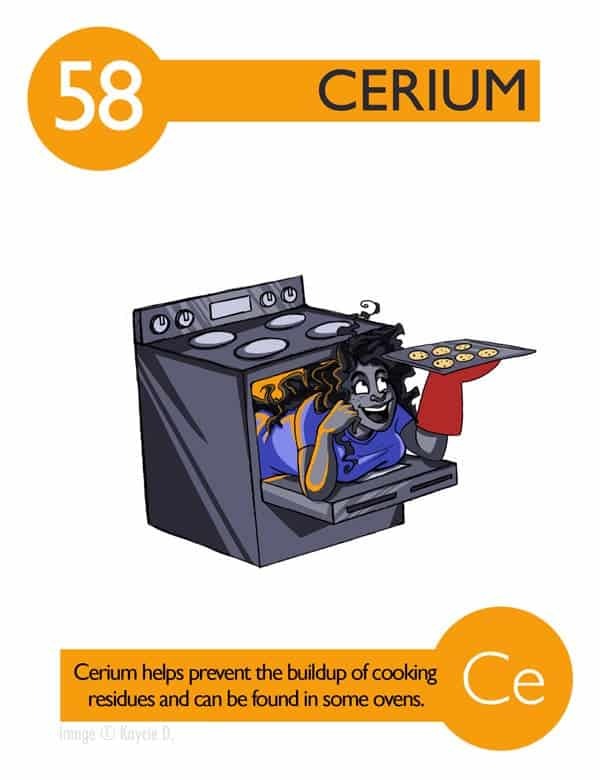 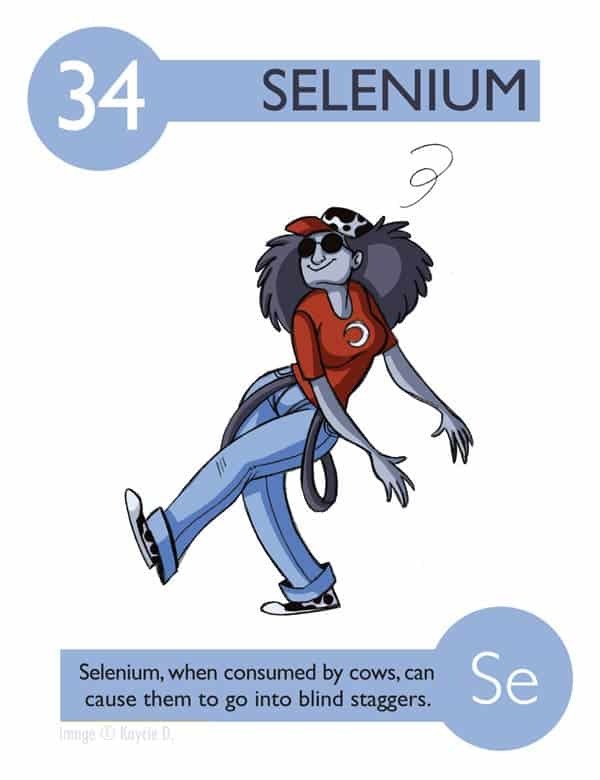 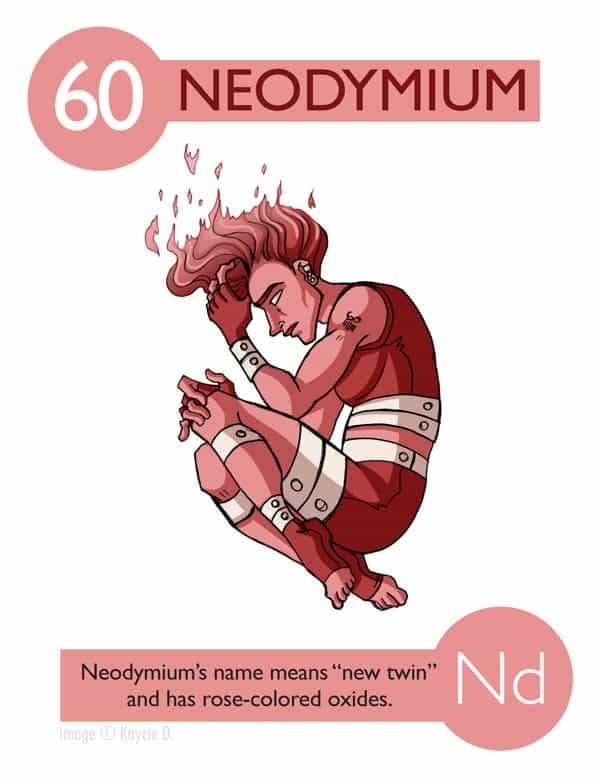 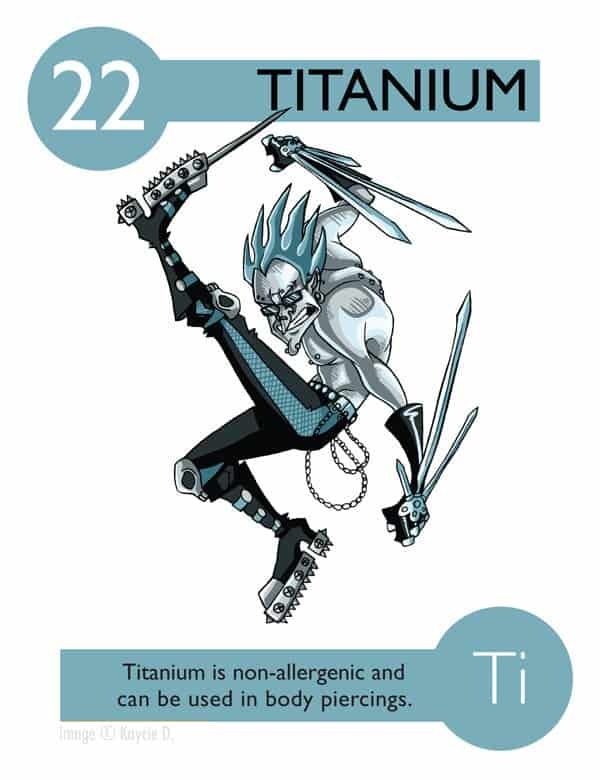 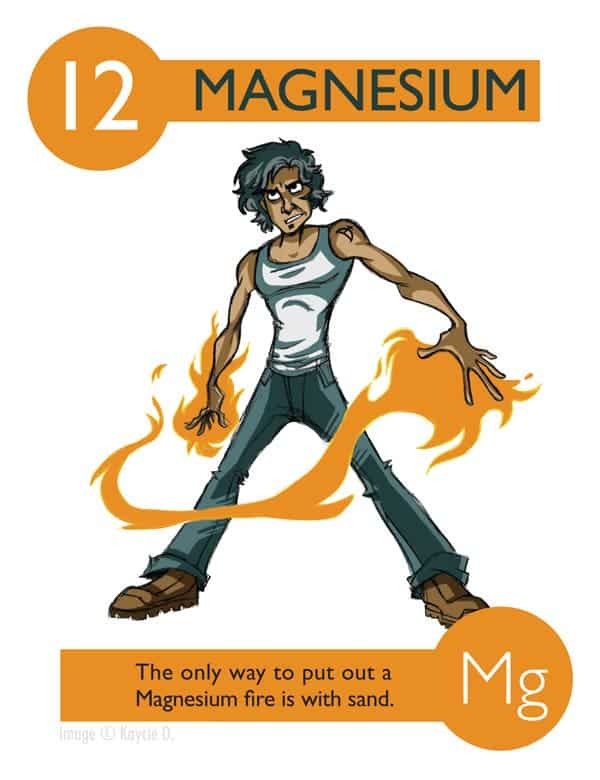 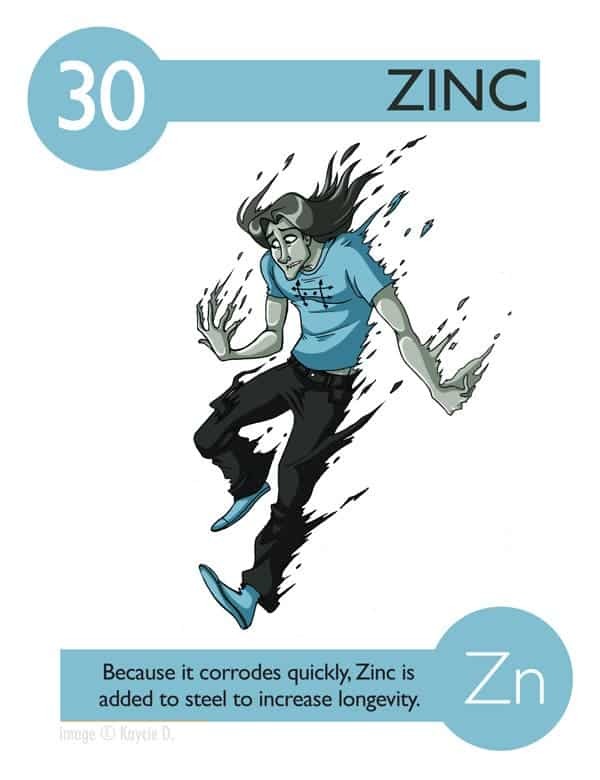 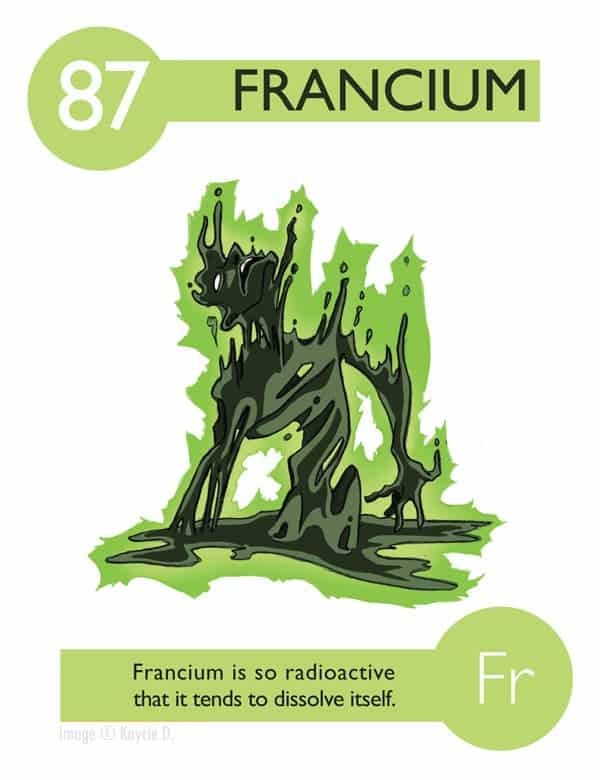 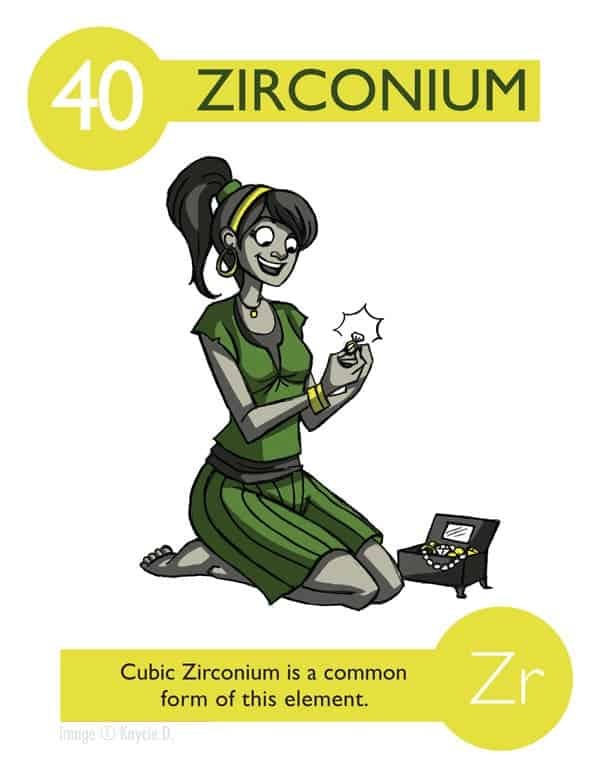 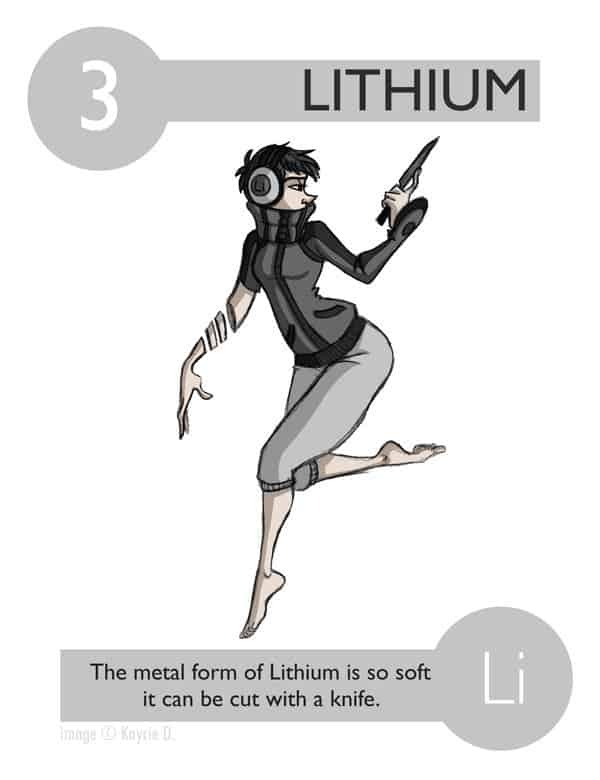 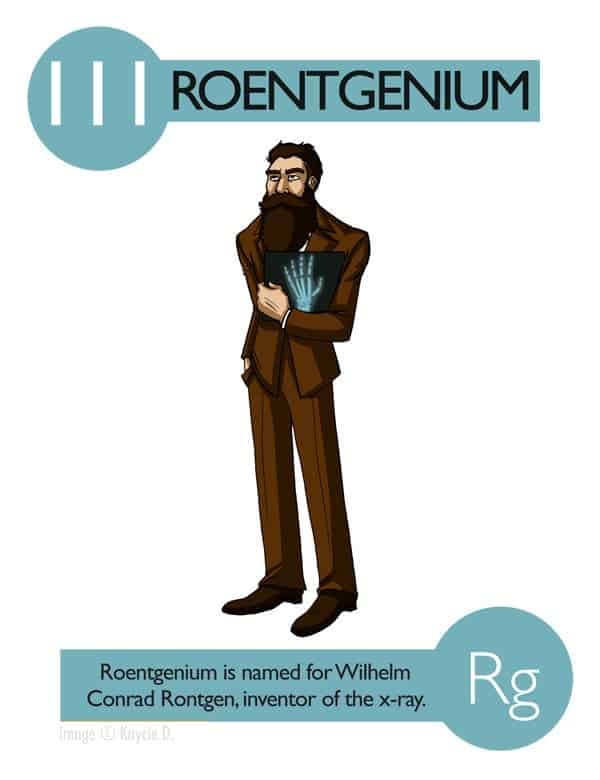 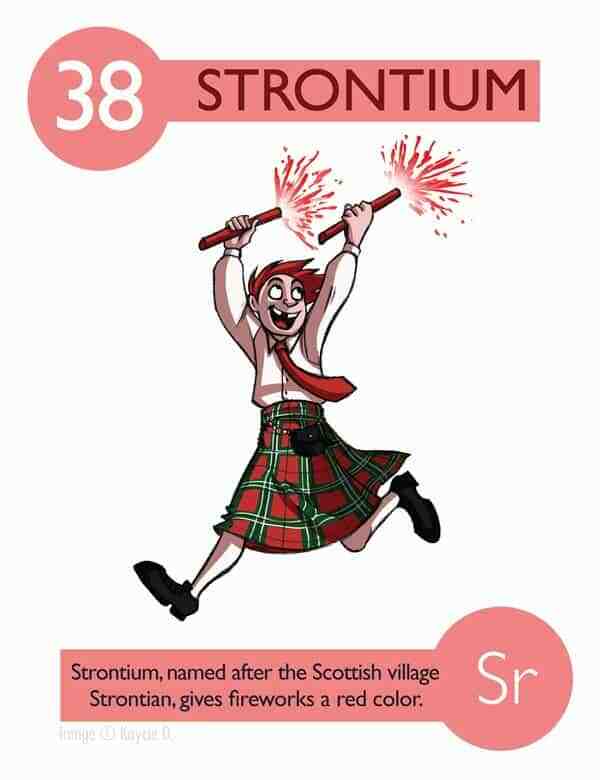 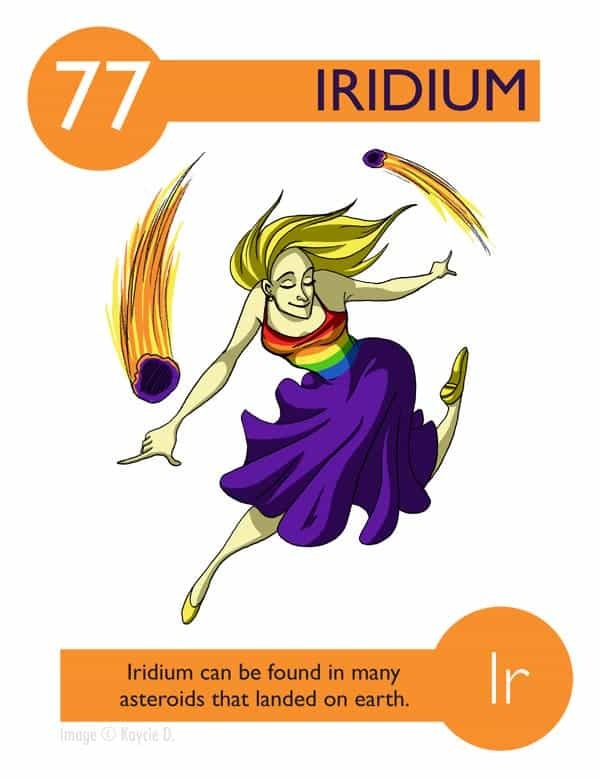 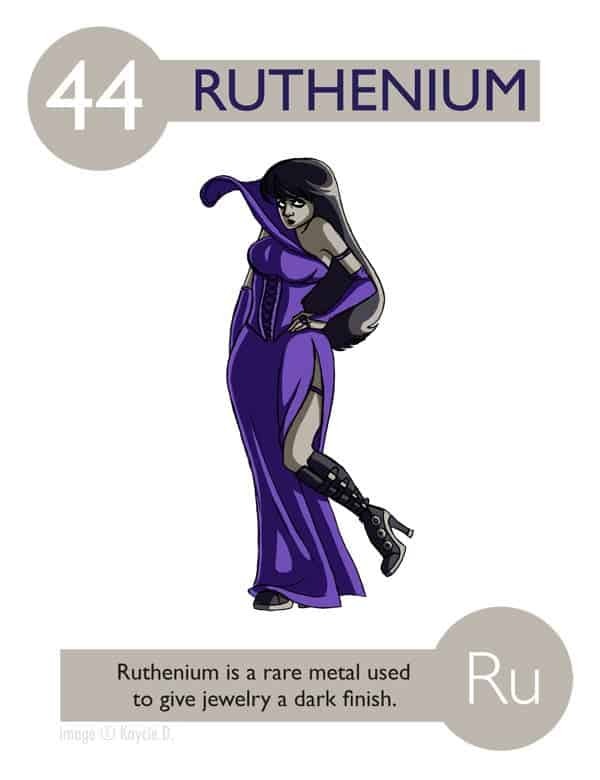 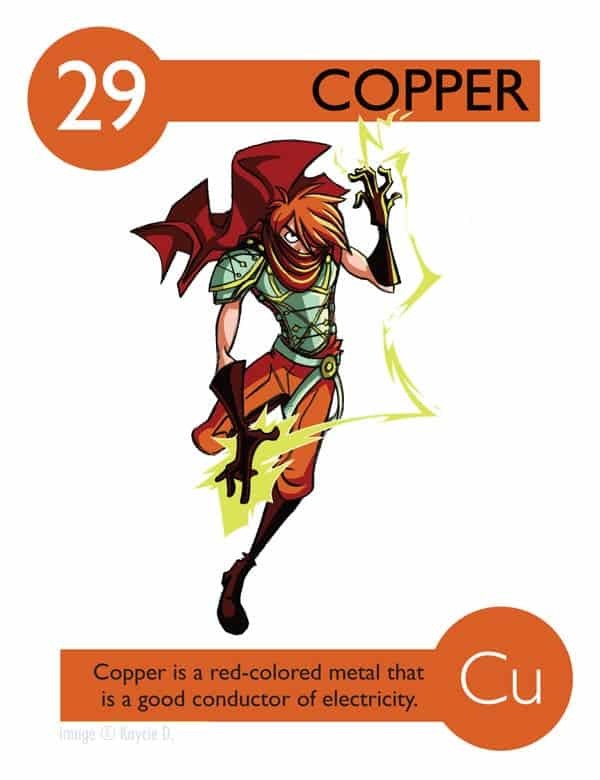 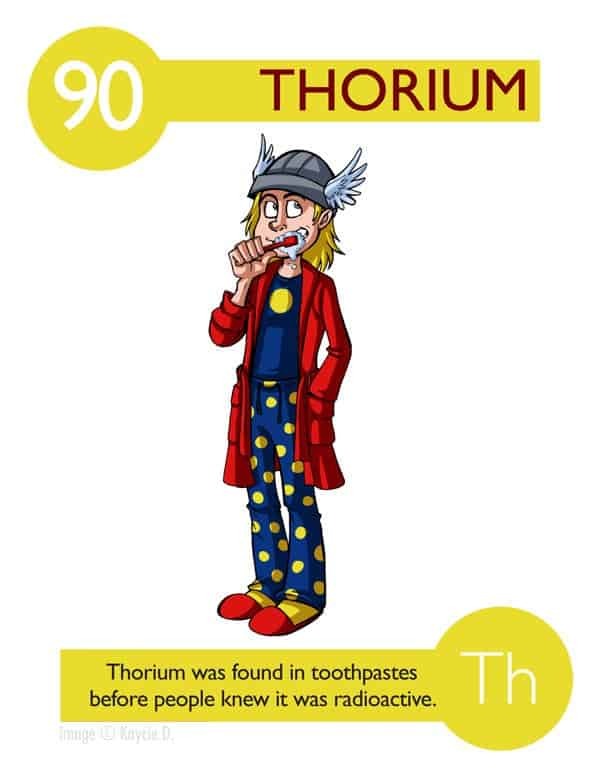 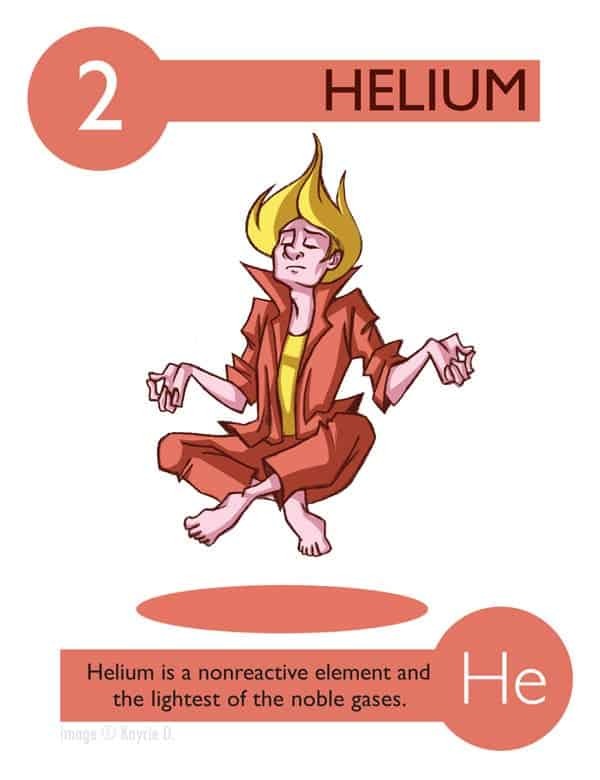 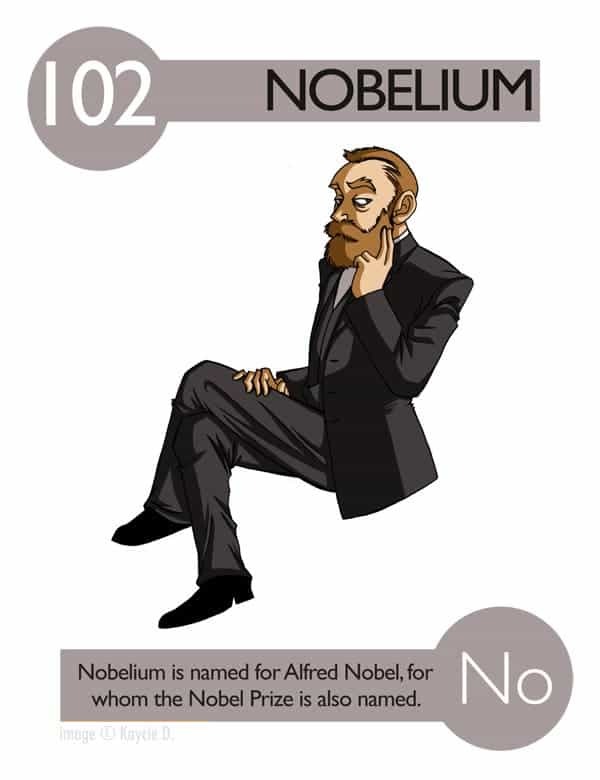 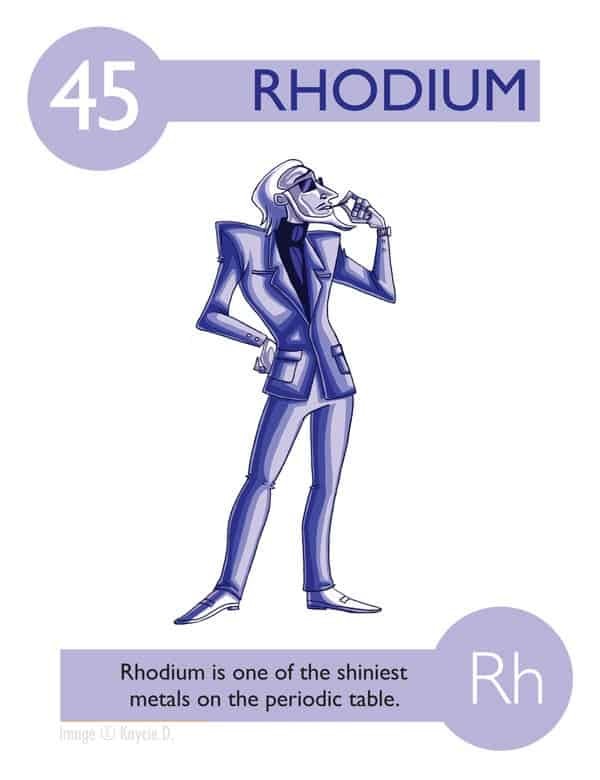 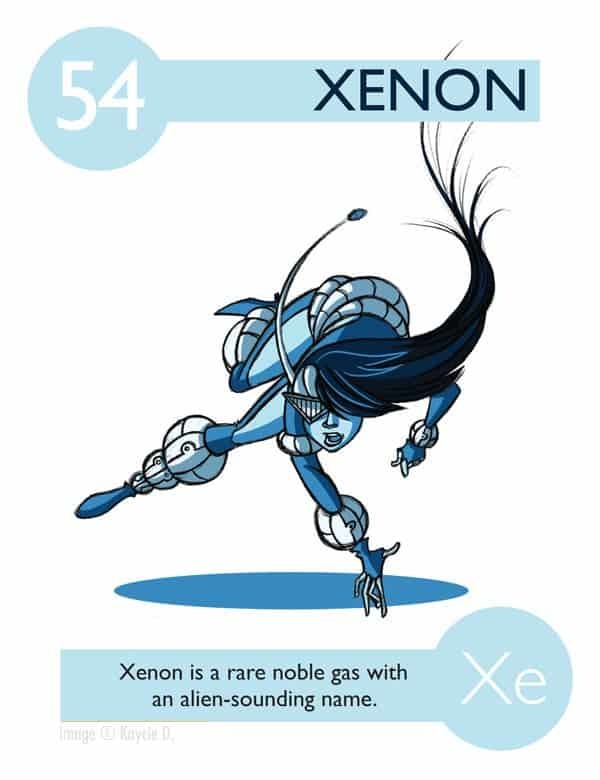 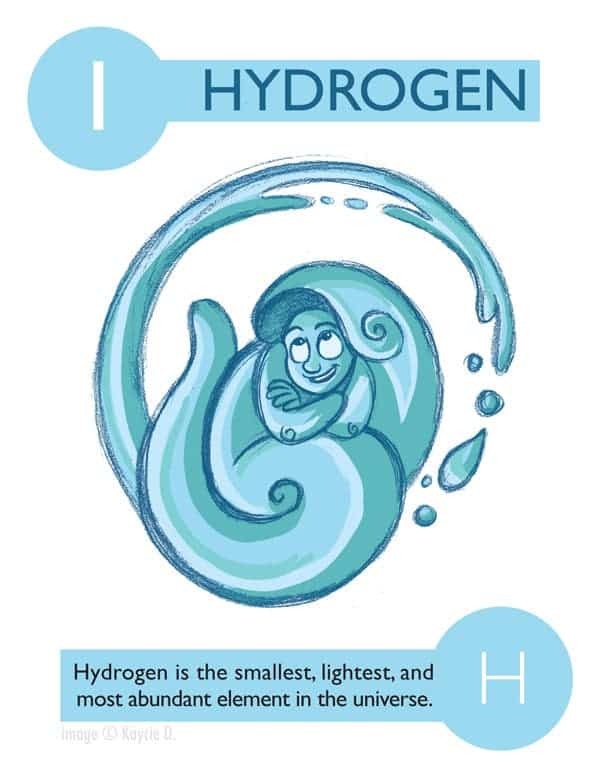 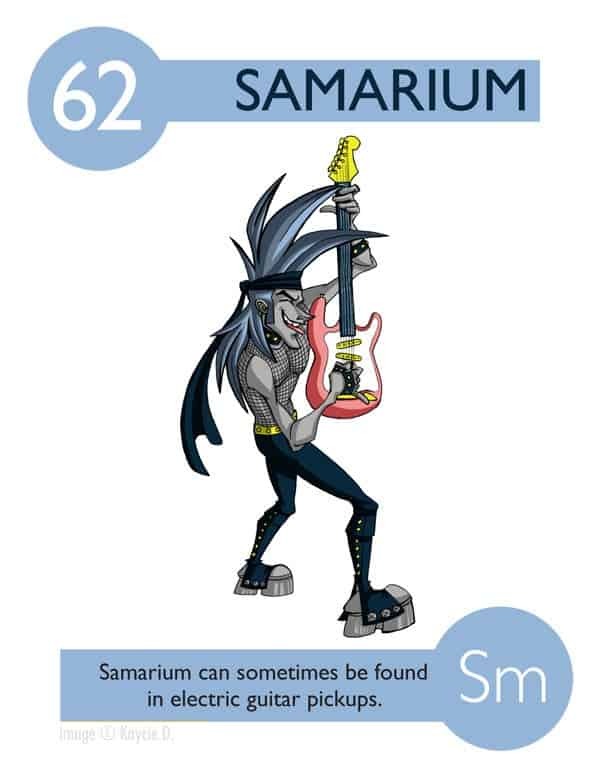 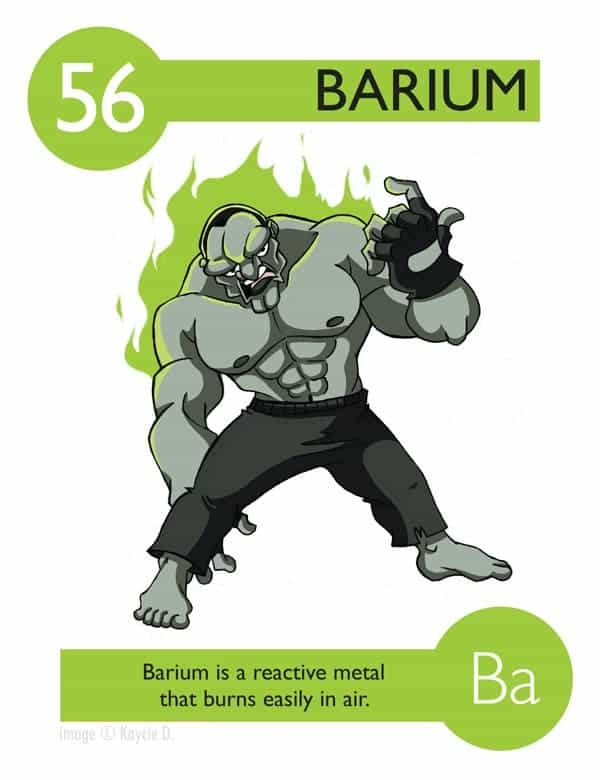 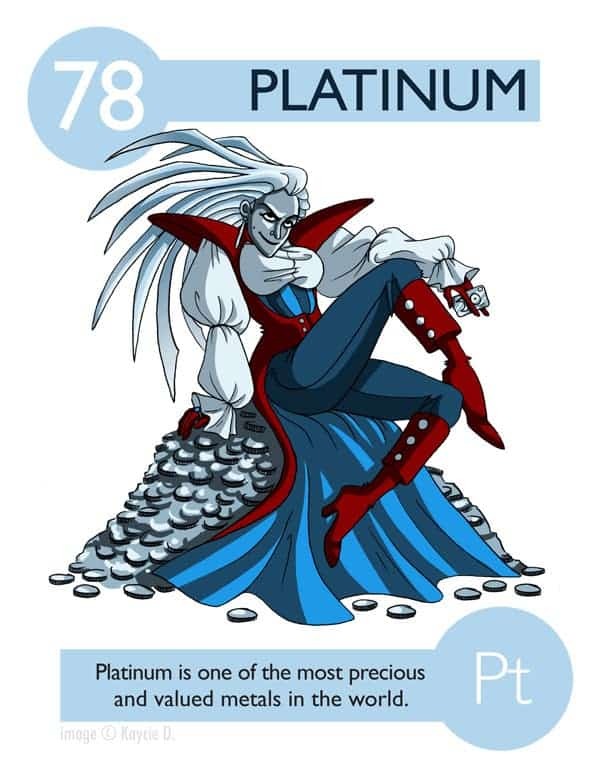 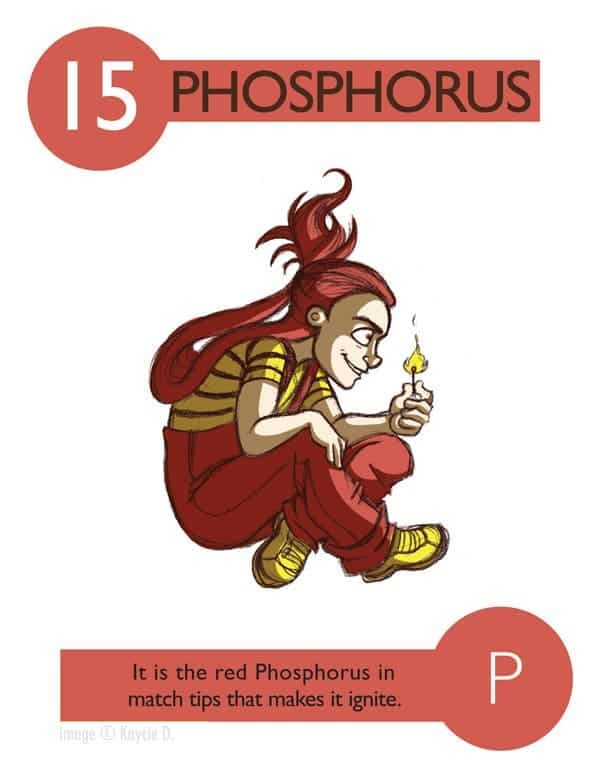 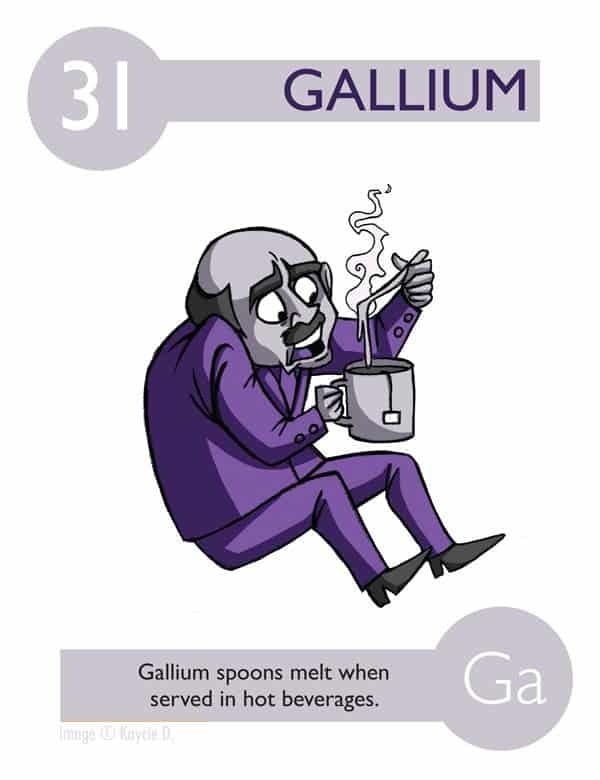 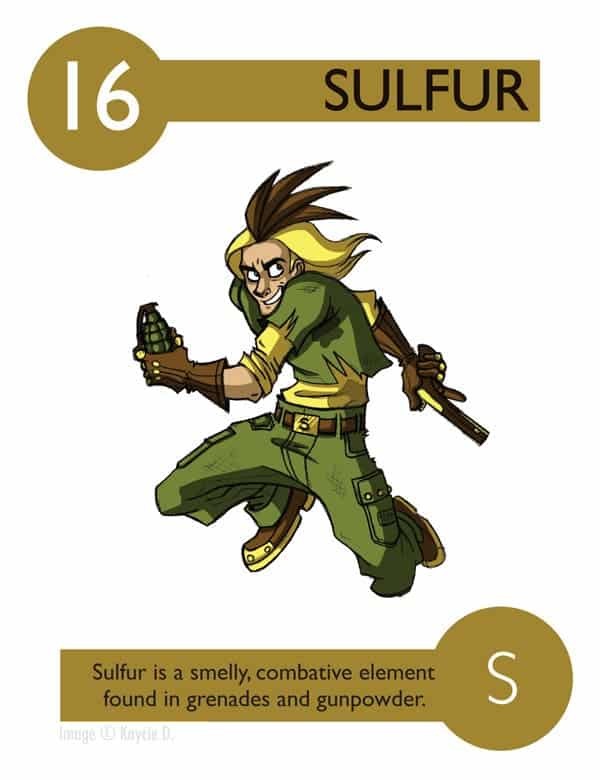 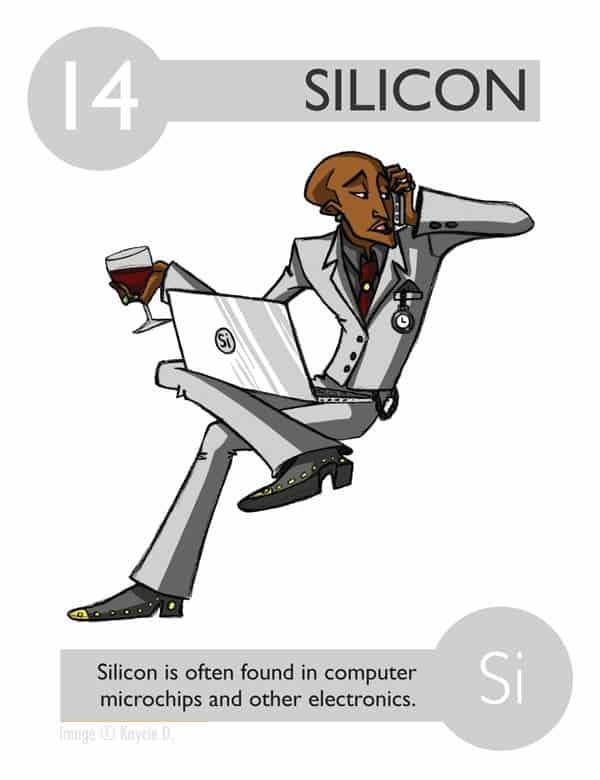 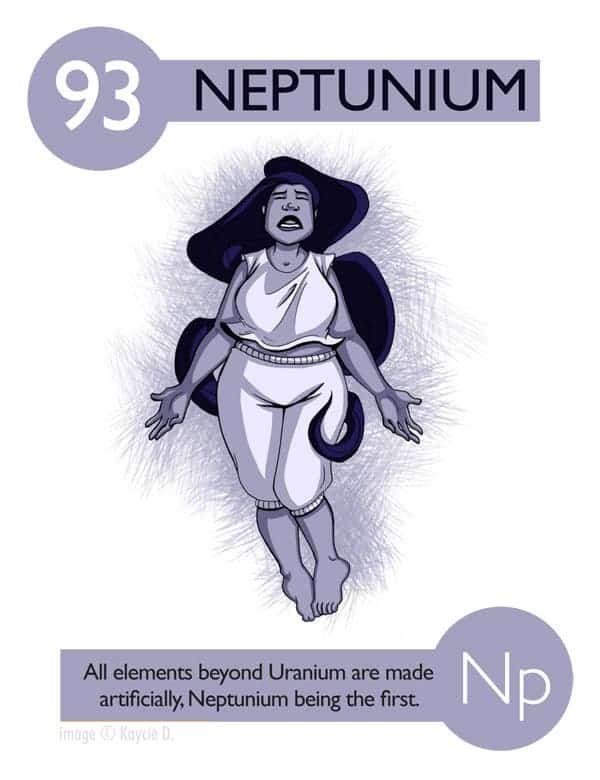 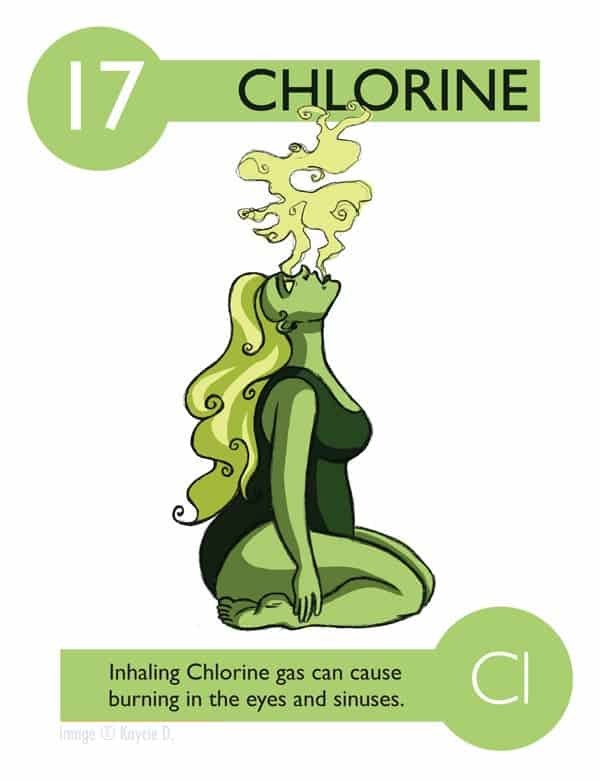 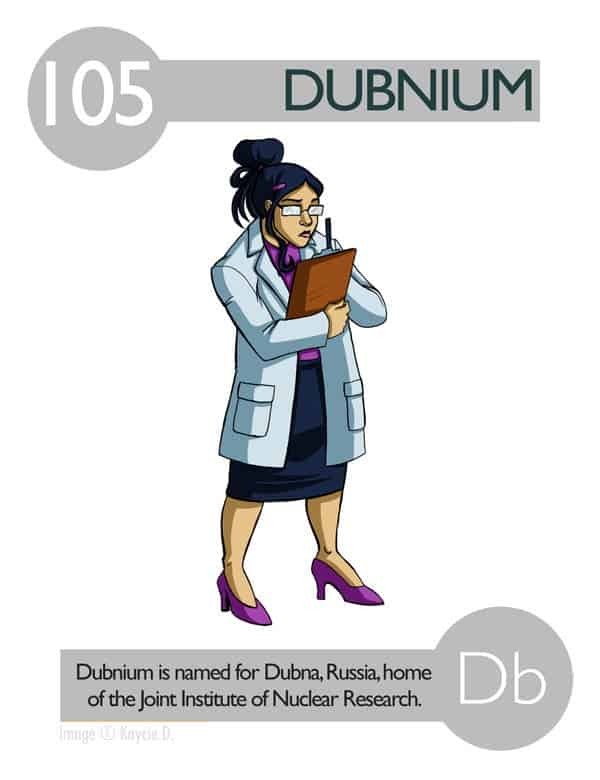 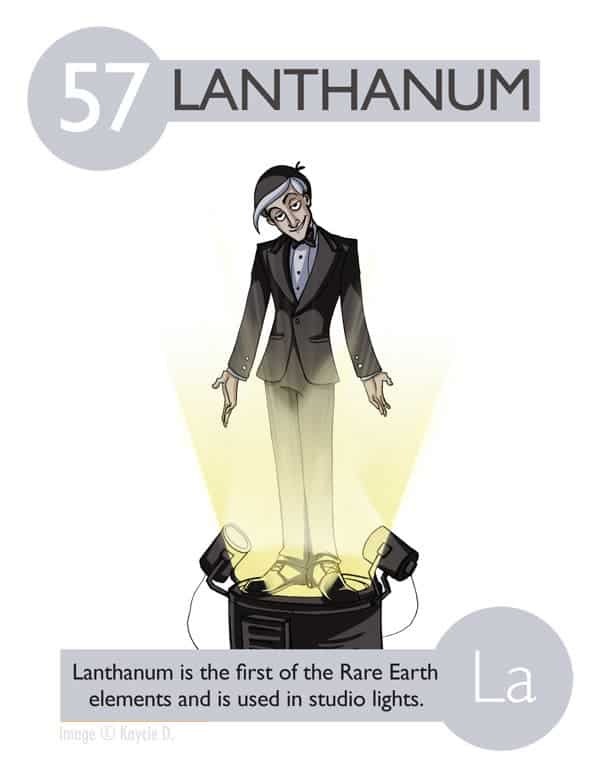 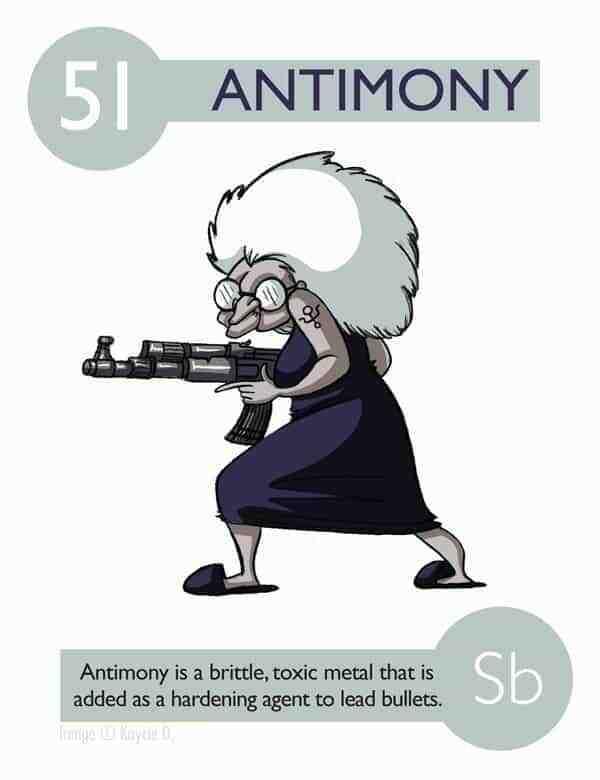 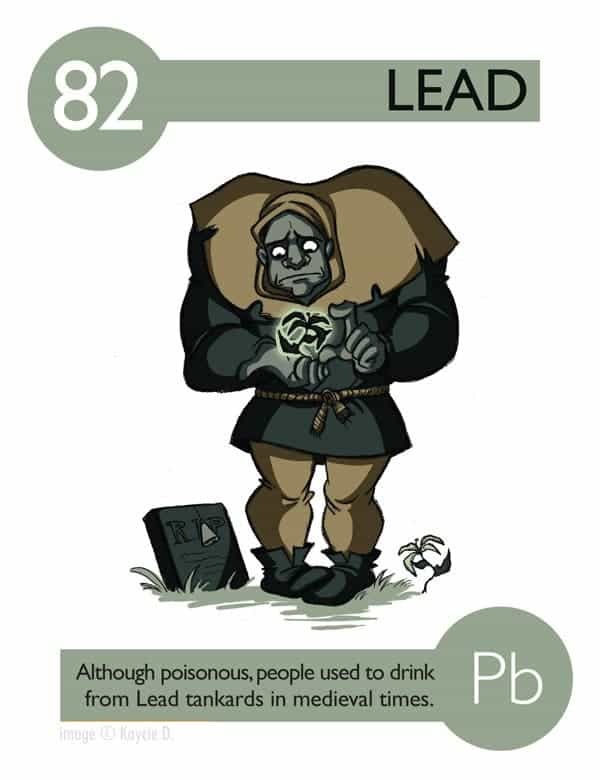 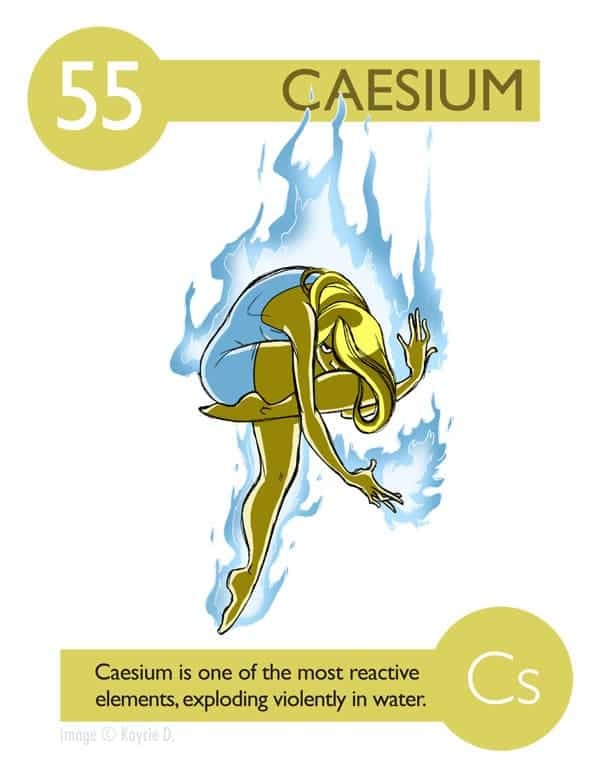 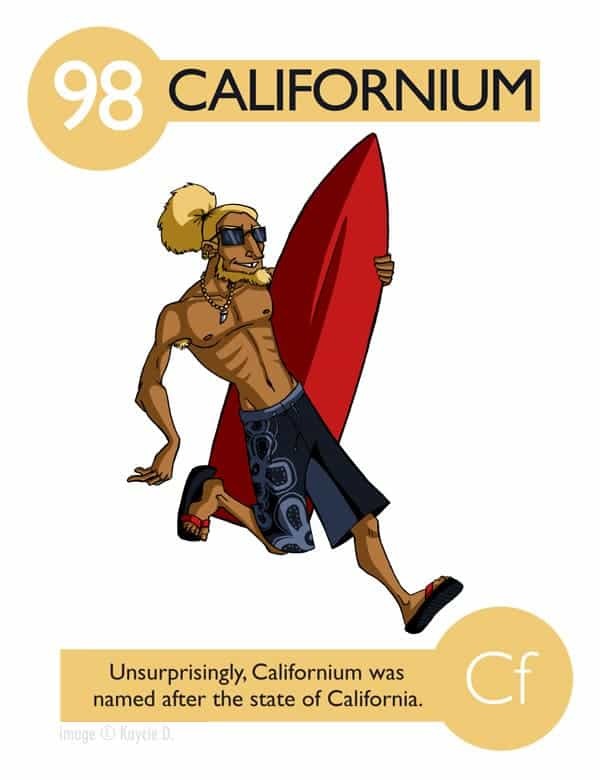 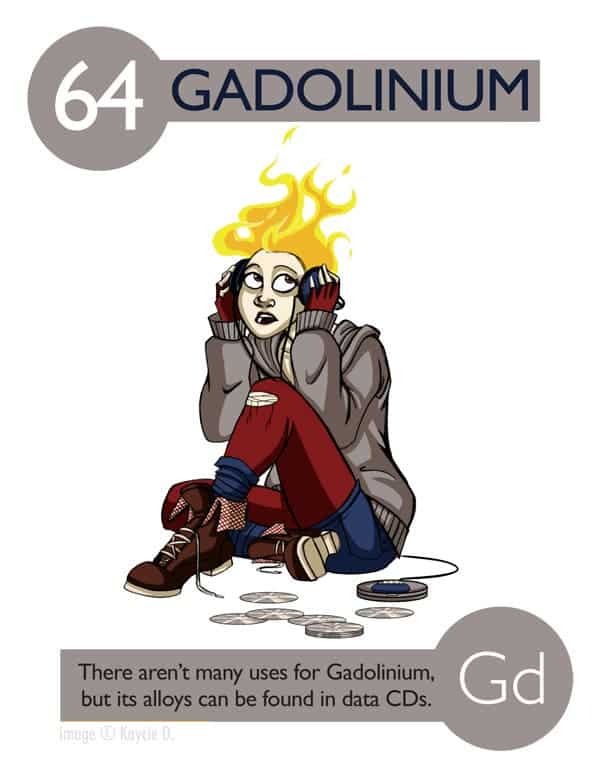 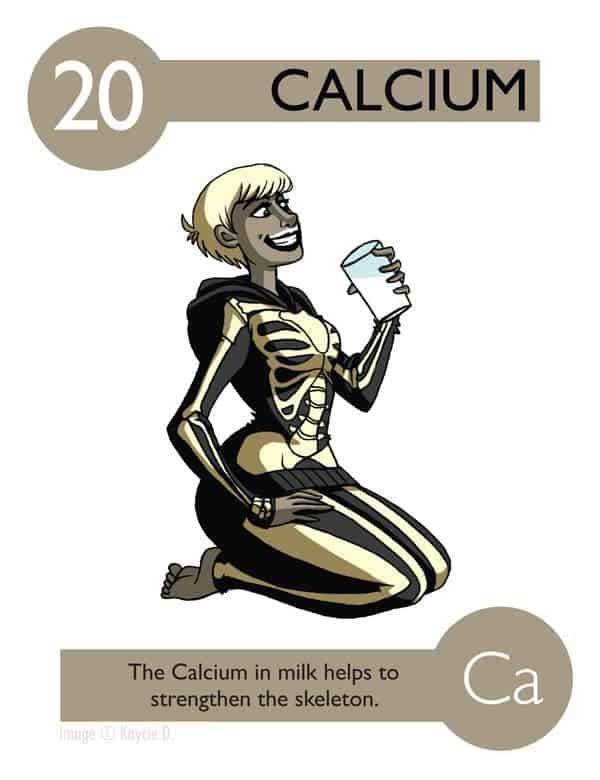 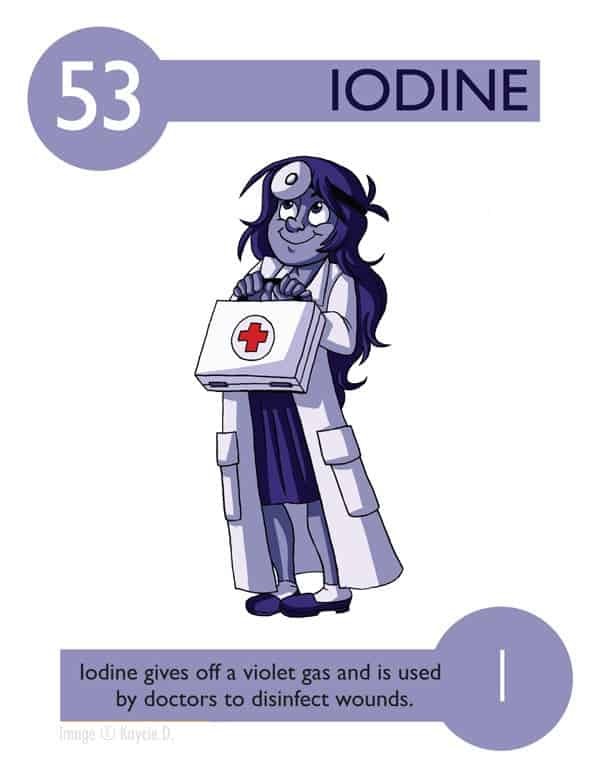 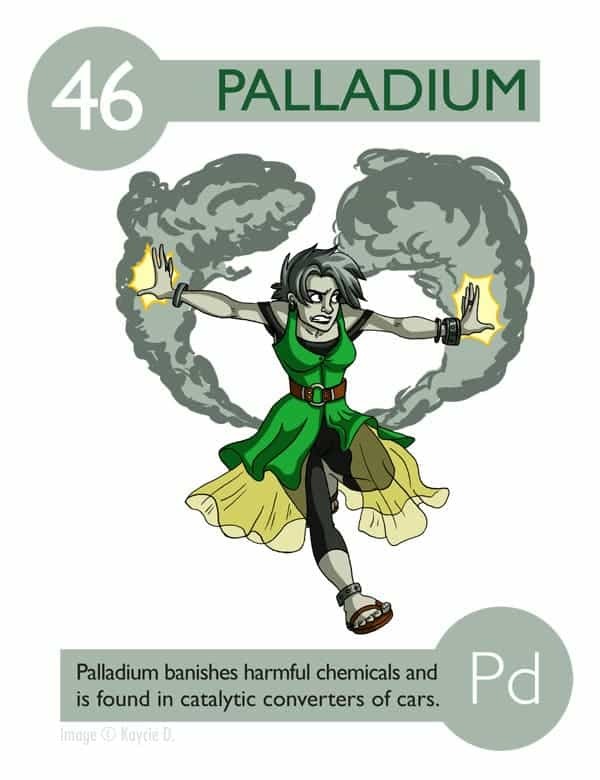 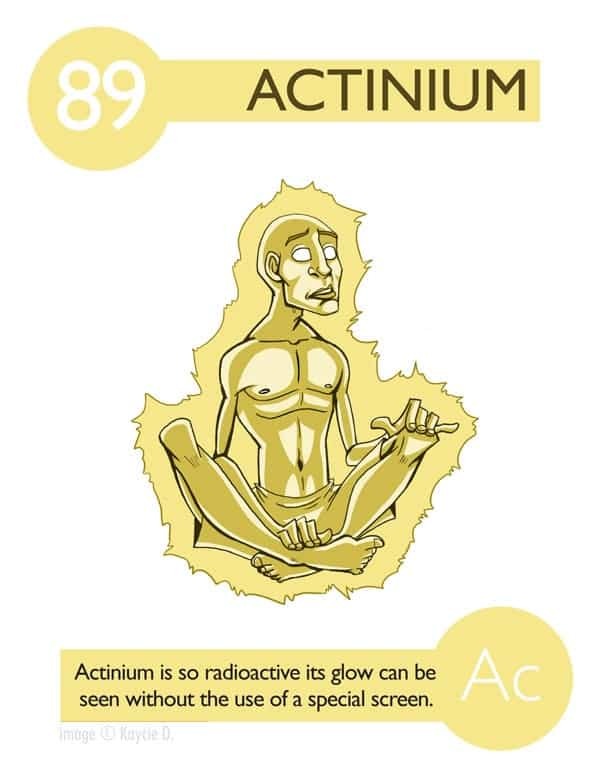 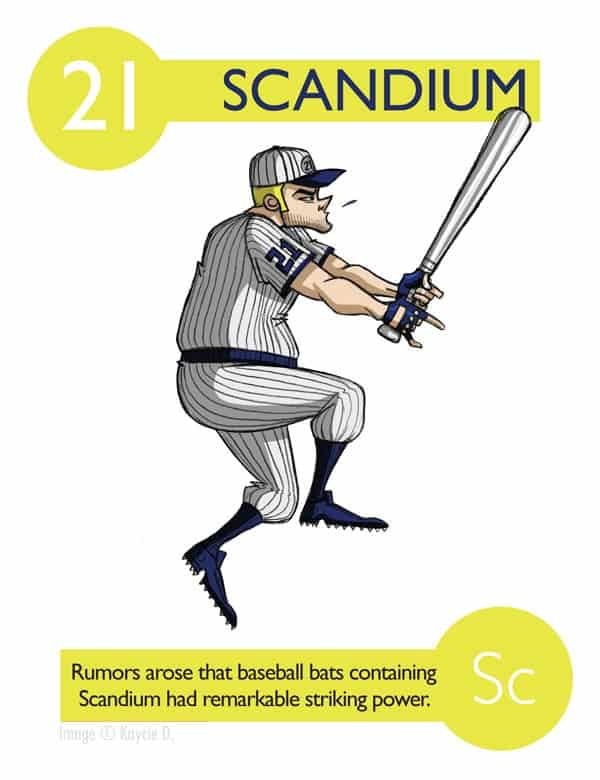 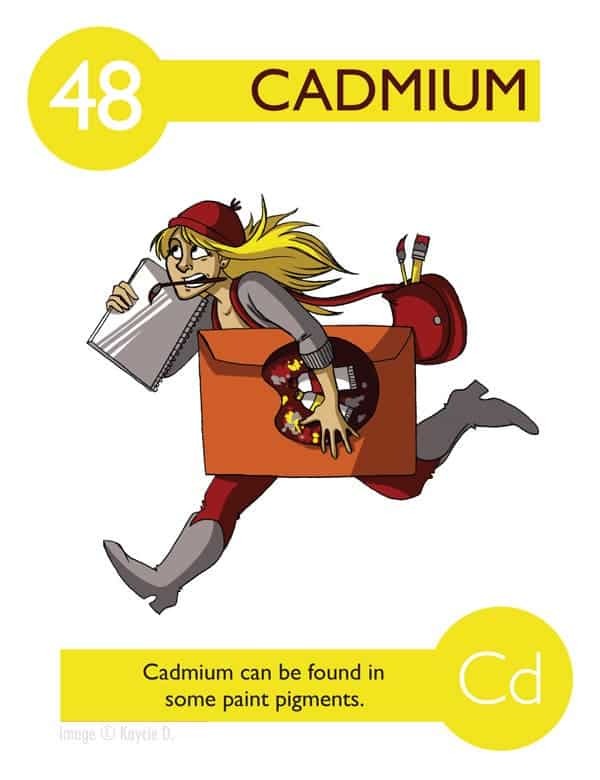 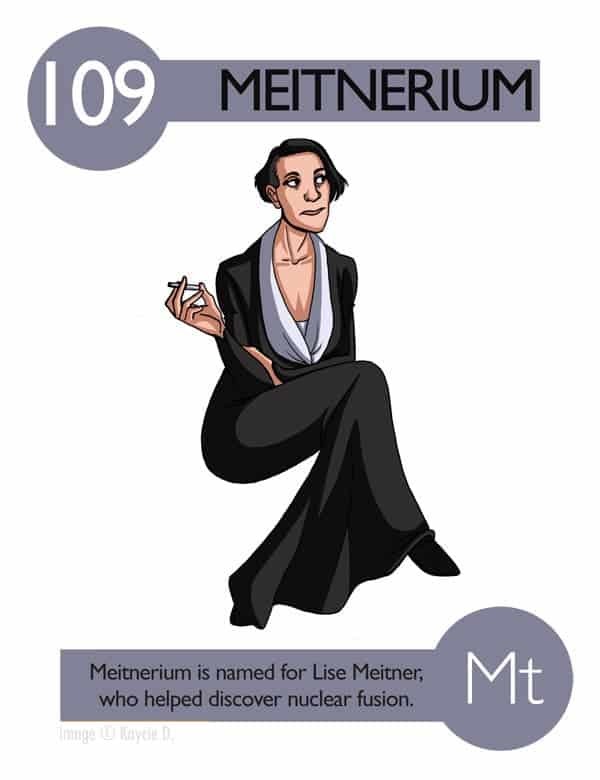 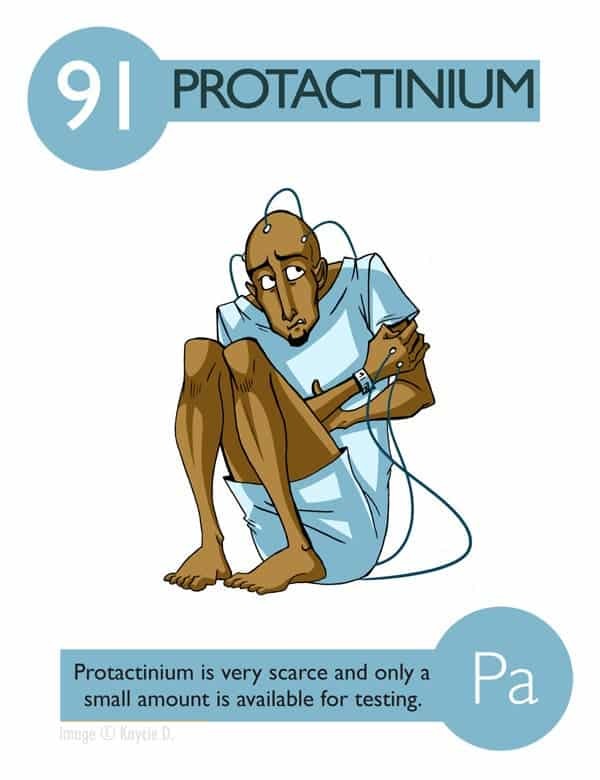 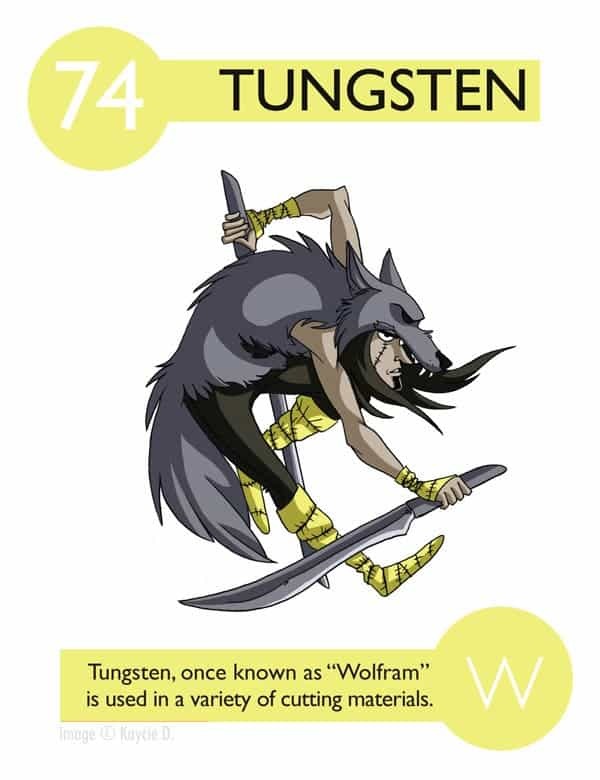 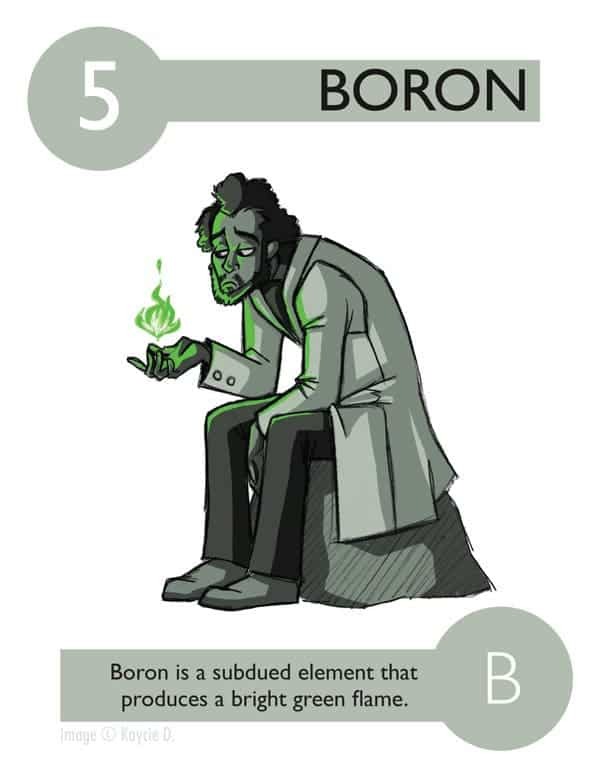 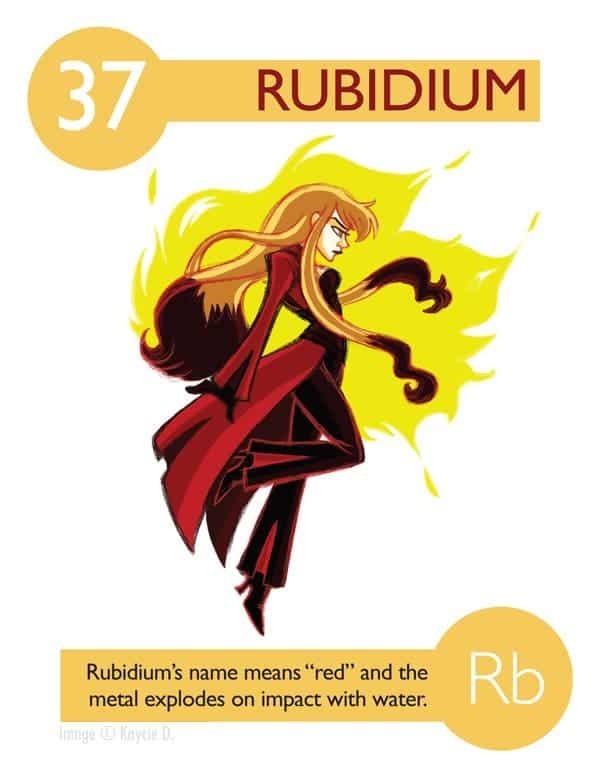 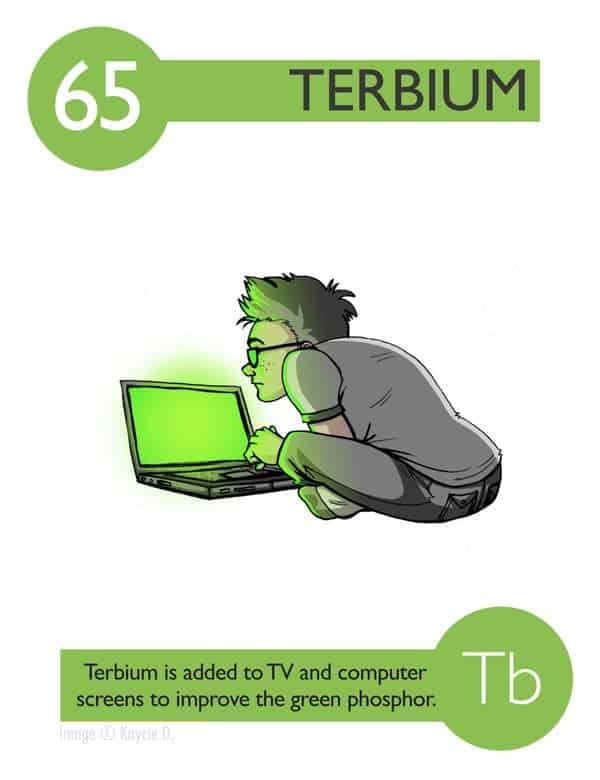 Each card includes an element image on the front and its atomic weight, density, and fun fact on the back. 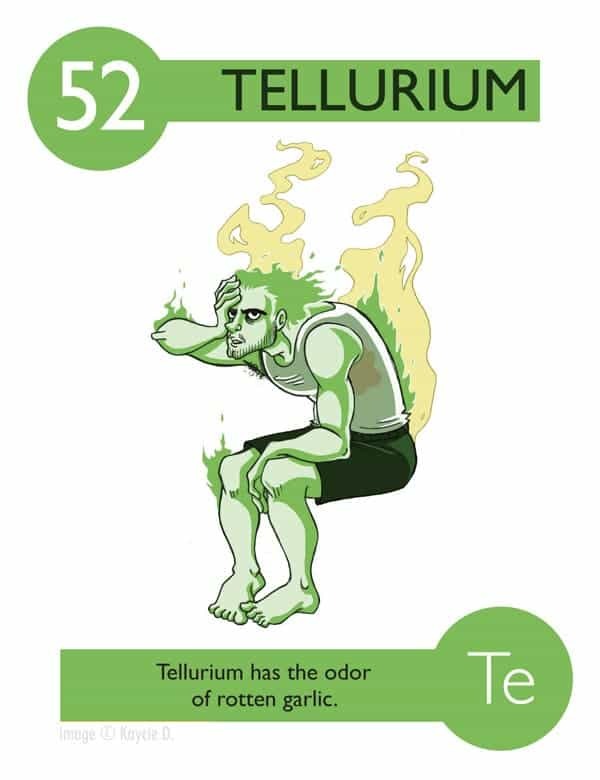 You can order your own deck for $35.